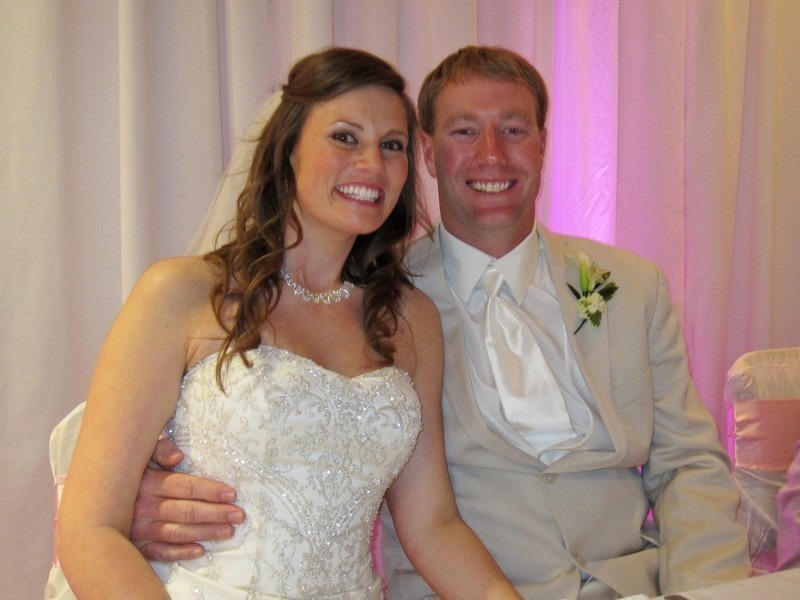 Jamie Dunn and T.J. Loger were married on the Sunday before Memorial Day at Christ’s Family Church in Davenport Iowa. 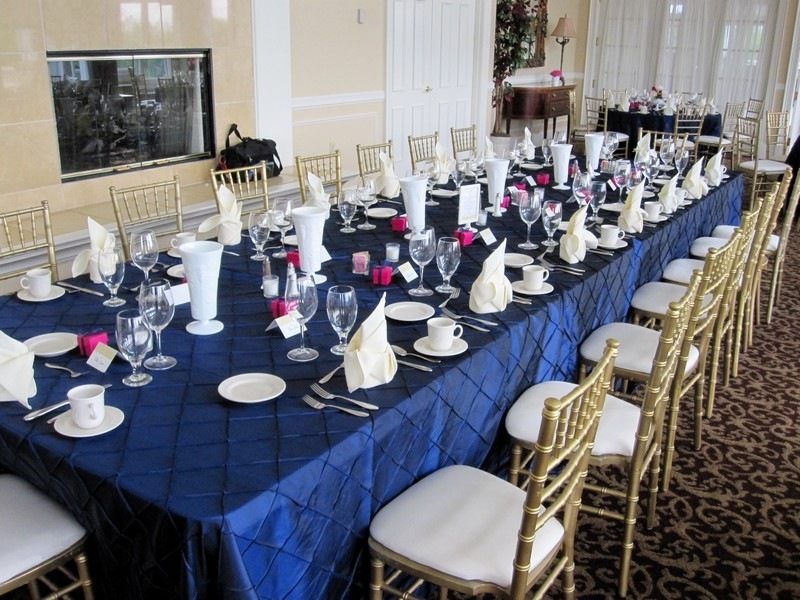 A big reception at the elegant Davenport Country Club took place immediately afterwards. Jamie and TJ looking forward to dinner! 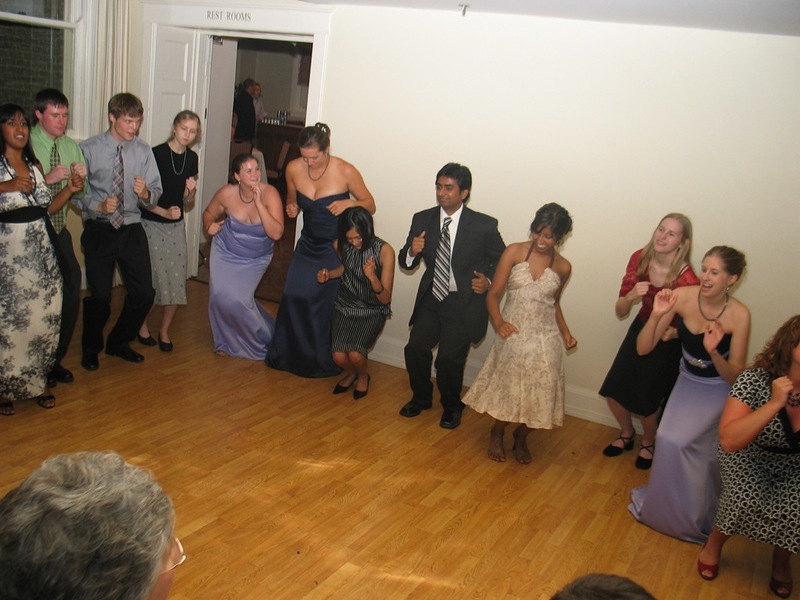 The wedding party entered the room to “Get On The Floor” by Jennifer Lopez. Jamie and TJ entered the room to applause and the song “Chelsea Dagger” (one of my favorites). 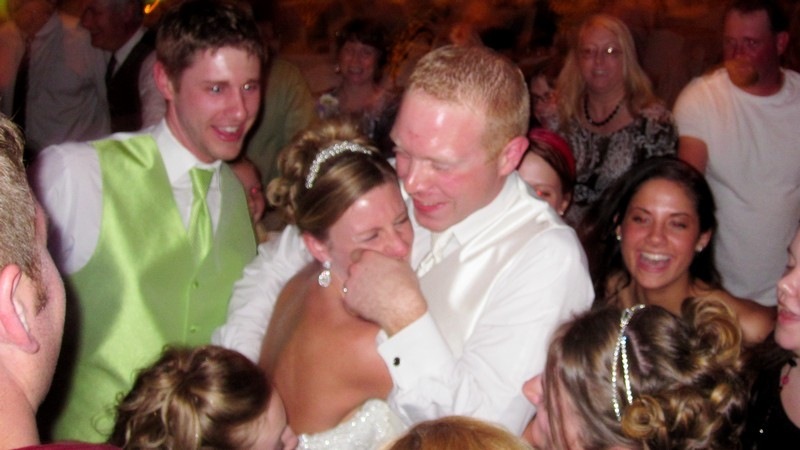 The couple had their first dance to Miranda Lambert’s “Making Plans” immediately after their entrance. The Father of the Bride, Tom Dunn, offered a warm welcome speech and dinner was served after a prayer by Pastor Tim Truesdell of Christ’s Family Church. Later, toasts were offered by Shannon and Josh, Maid of Honor and Best Man. Jamie was a member of the University of Iowa Dance Team, and at 10:00 she, along with her friends from the team, did a special performance of the Iowa Fight Song! 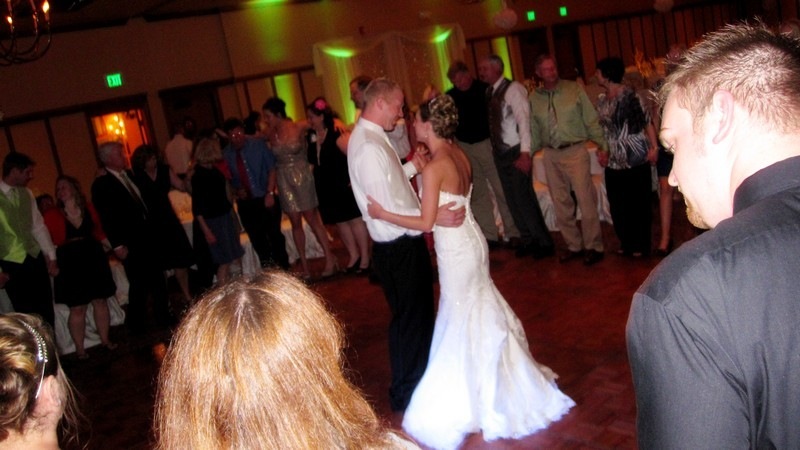 Jamie and TJ’s first dance as husband and wife! 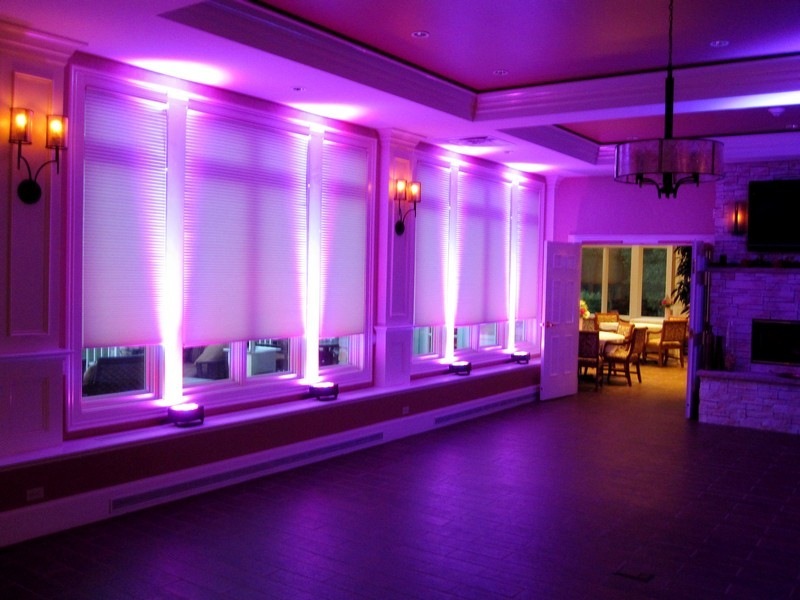 We used battery powered uplighting to create an uncluttered look which was important since the lighting was on the window sills. 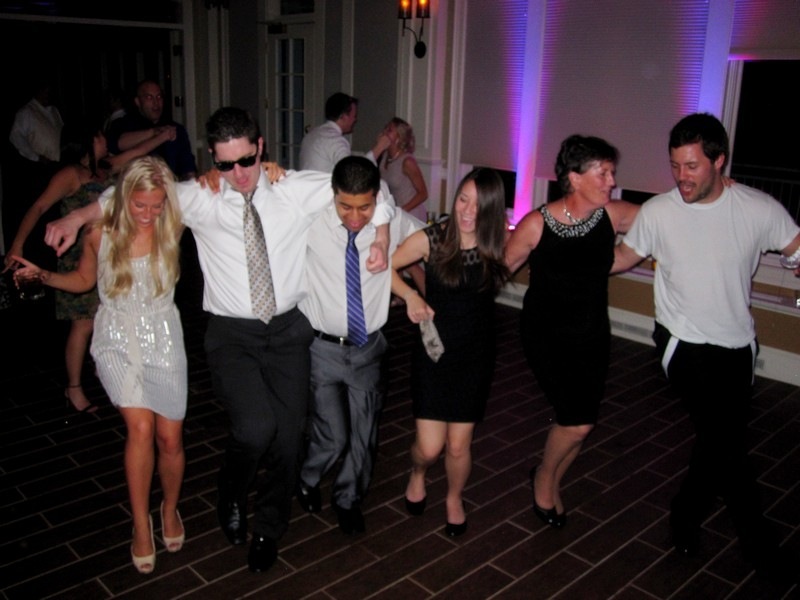 Jamie and TJ’s guests had an exciting night on the dance floor. 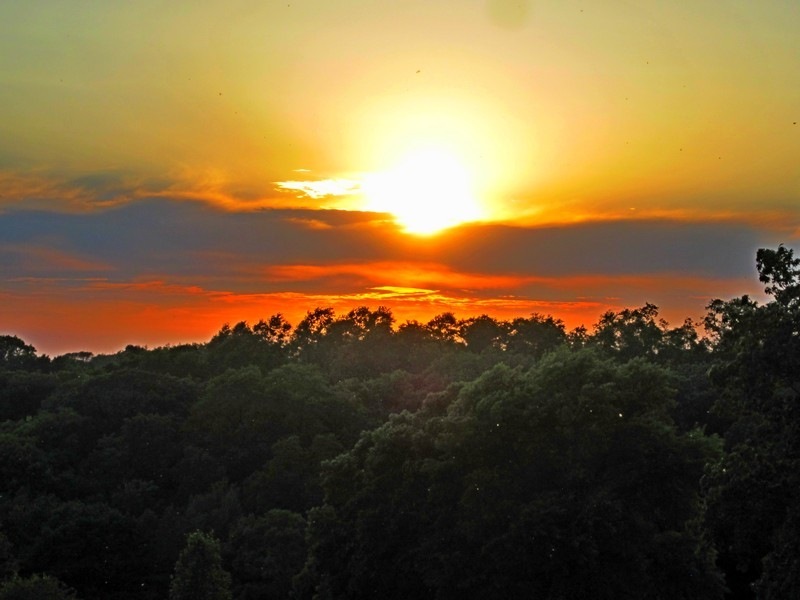 A typically beautiful Davenport Country Club sunset. Many heartfelt thanks to Jamie and TJ for allowing me to help them celebrate the beginning of their new life together! 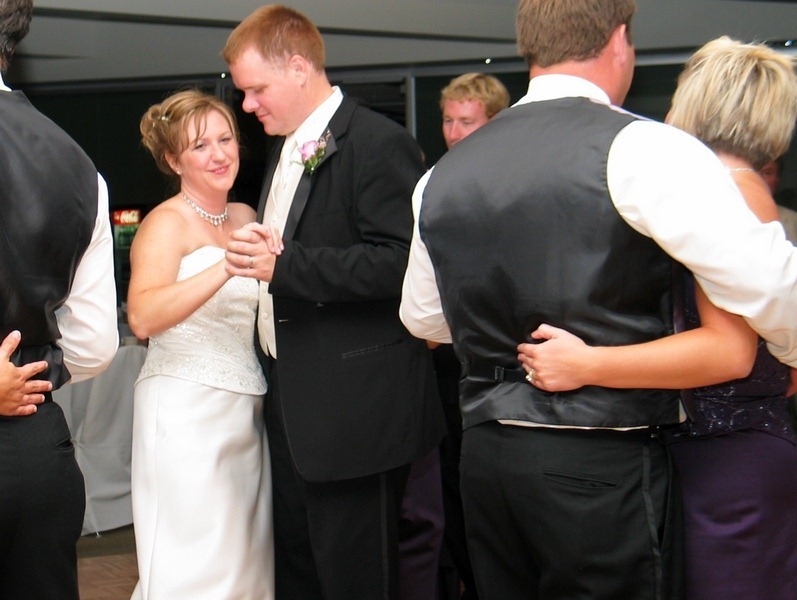 David and Kailan (LaFrenz) Neff celebrated their wedding reception at the elegant Mozart Room in the Bavarian themed Lodge Hotel on May 19, 2012. 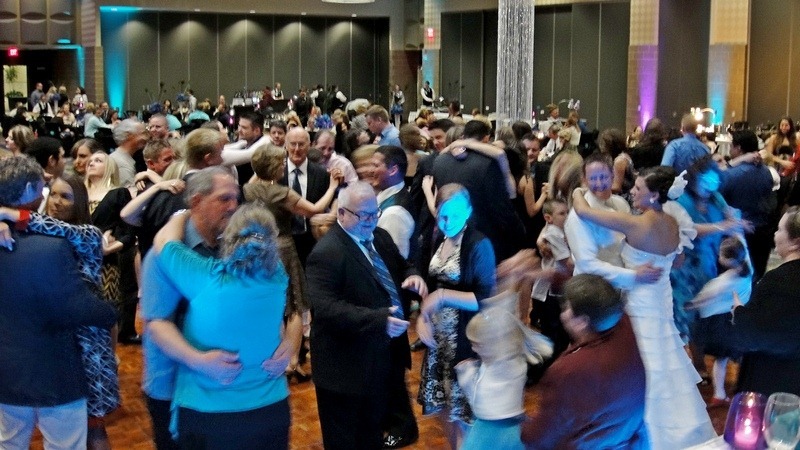 There were 245 guests present and they sure had a great time! 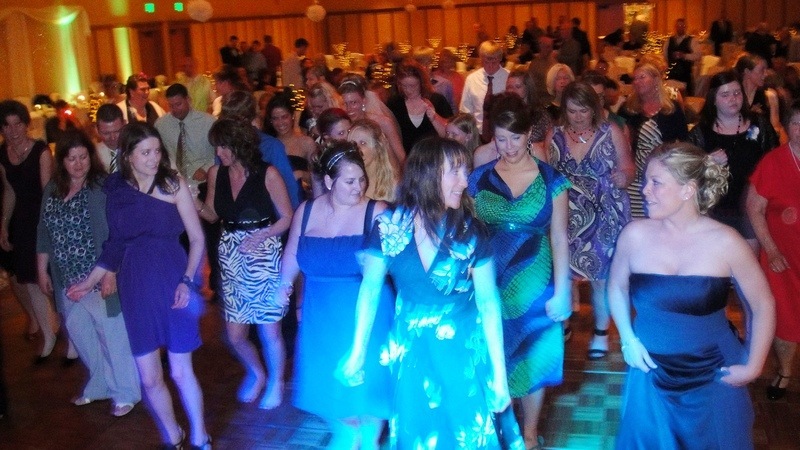 Fun on the Abbey Hotel’s legendary dance floor! 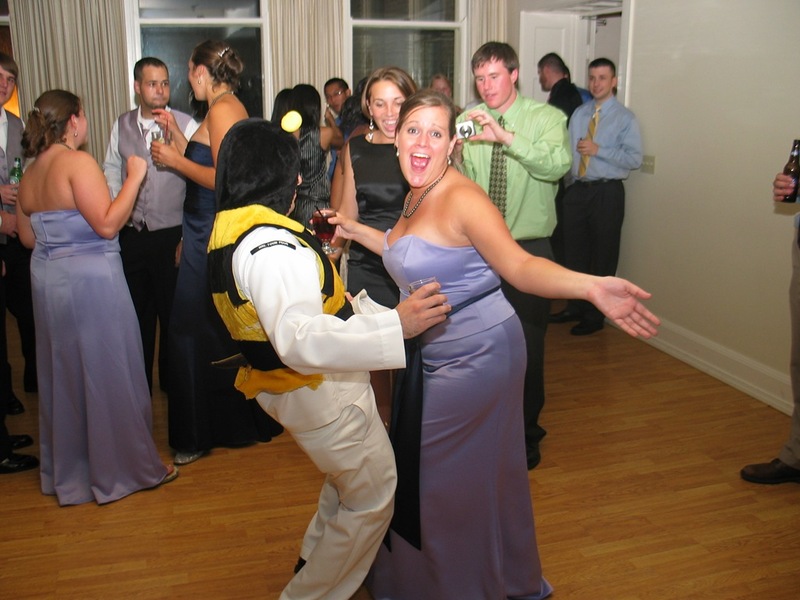 One of the big hits at Katherine and Geoff’s 2007 wedding reception was this “Bee Suit”. At least a half dozen people took turns wearing the suit, including myself. This picture is a little misleading, but the sailor wearing the suit actually has a drink in his hand, so things are not as they appear at first glance! 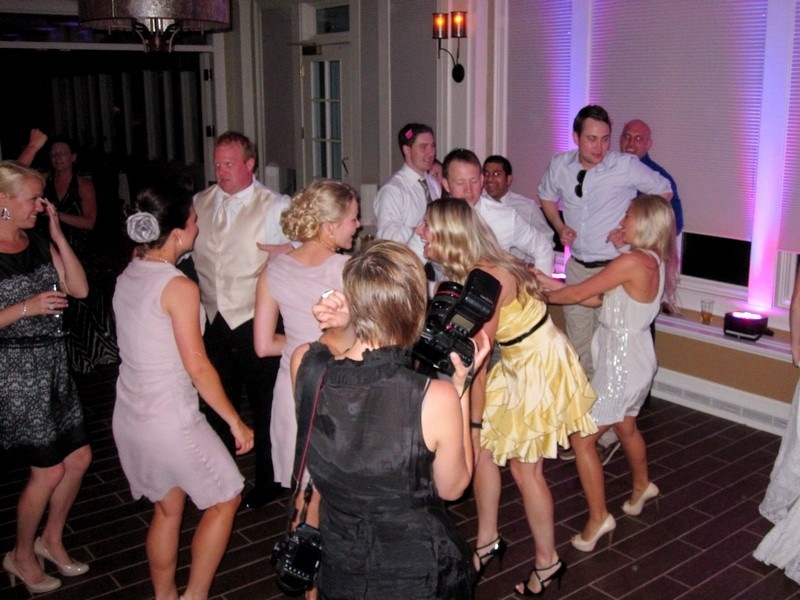 Fast forward 5 years and I was thrilled to be asked to DJ for Katherine’s brother David Neff at his May 19 wedding to Kailan LaFrenz. I knew we would be in for another fun night! The Lodge Mozart Room is ready for Kailan and David’s guests. 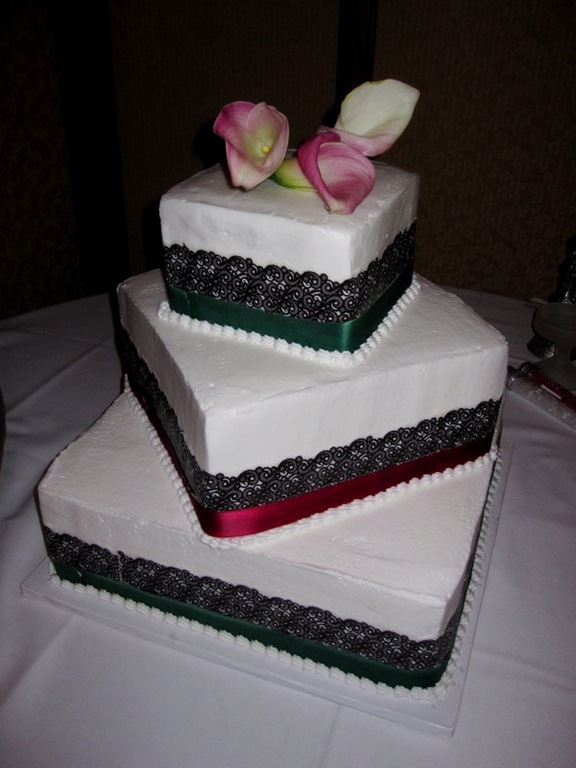 Delicious wedding cake from Hy-Vee. 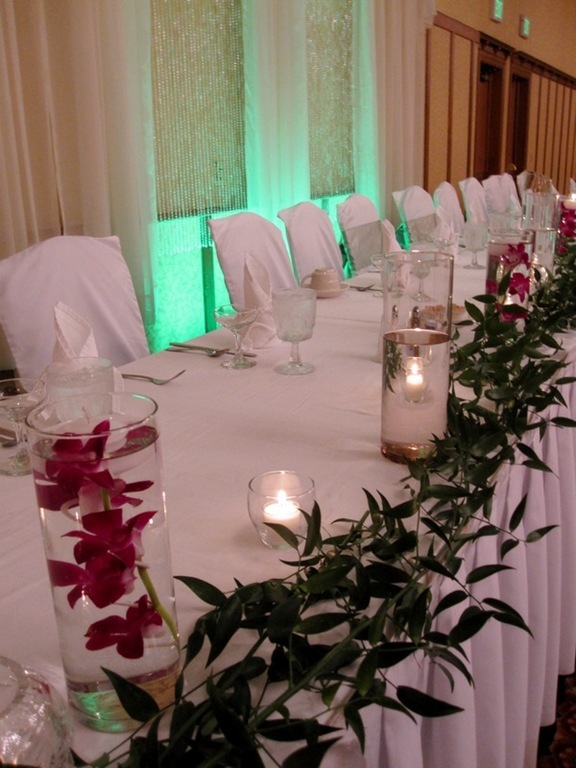 Kailan and David used our focal point uplighting feature, which is included in our wedding packages, to highlight their head table area in green. 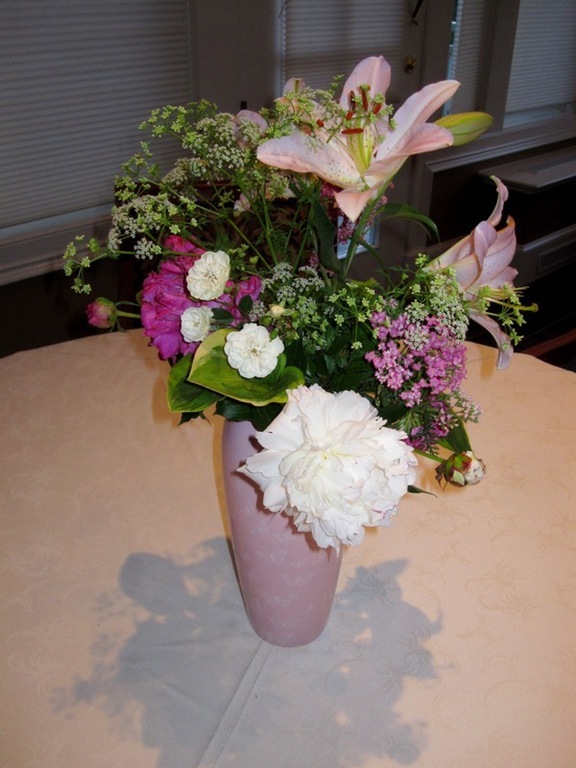 Floral design by Staack Florist. 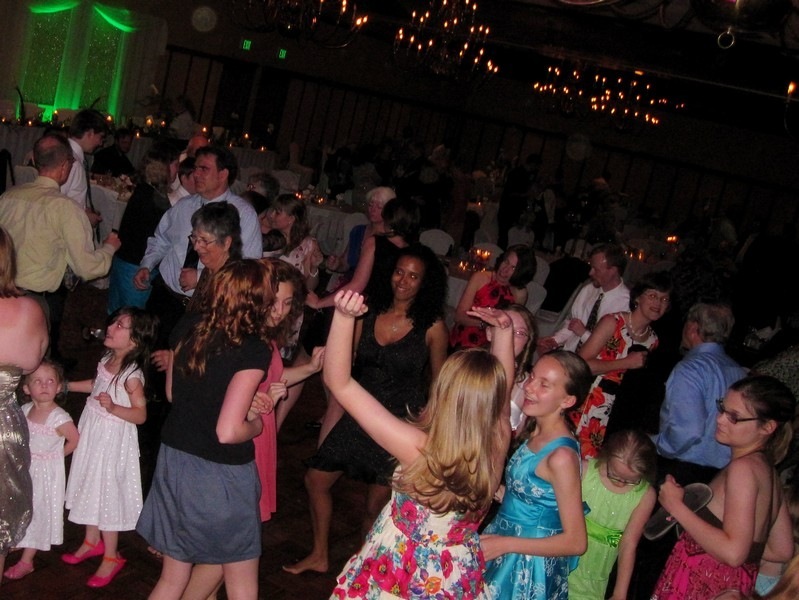 There was a lot of fun on the dance floor all night! Congratulations to David and Kailan as you begin your new life together! Thank you to the LaFrenz Family and to the Neff Family for having me back to help you celebrate another big milestone for your family! It was nice to see you all again and I hope to see you all again sometime soon! 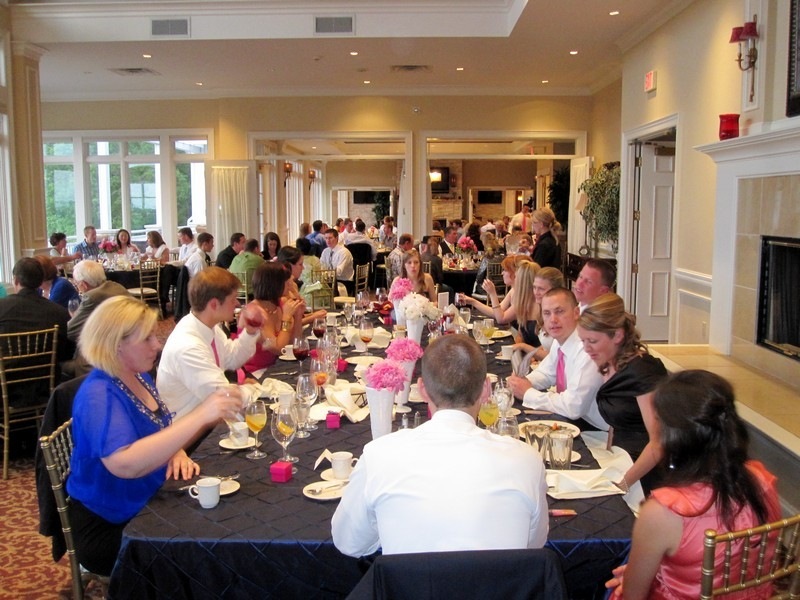 A beautiful day was in store on May 12, 2012 for the new Mr. and Mrs. Jamie and Andrew Porter and their Davenport Country Club Wedding Reception. 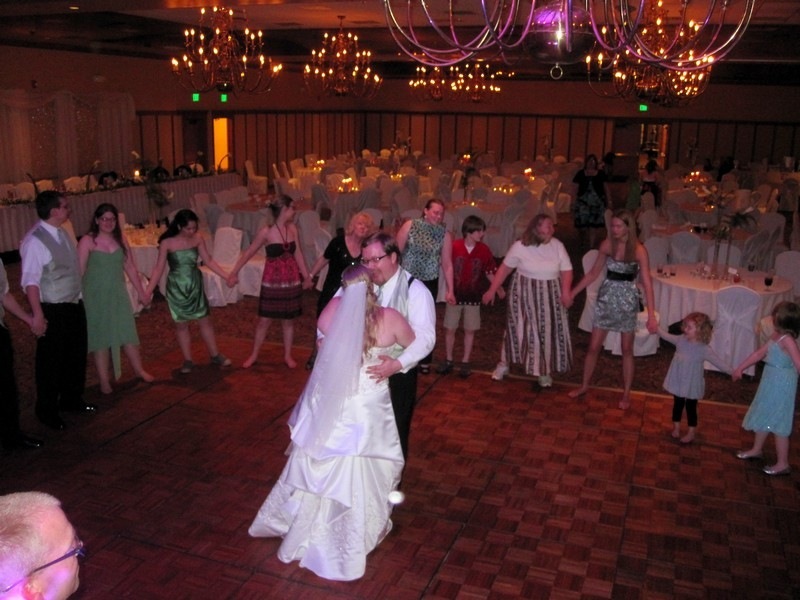 We were there to provide cocktail and dinner music, introduce the wedding party and provide music for the formal first dances. 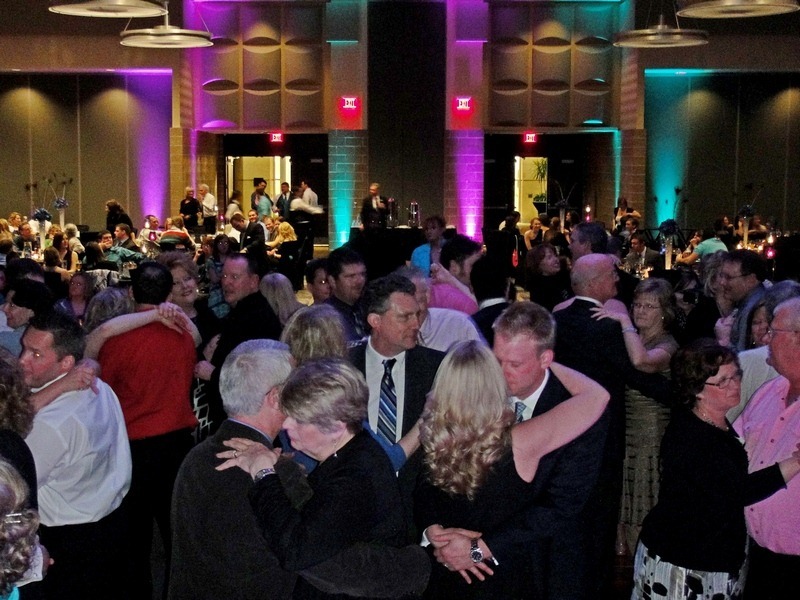 The popular local band, Funktastic 5 took over at 9PM to heat up the dance floor. 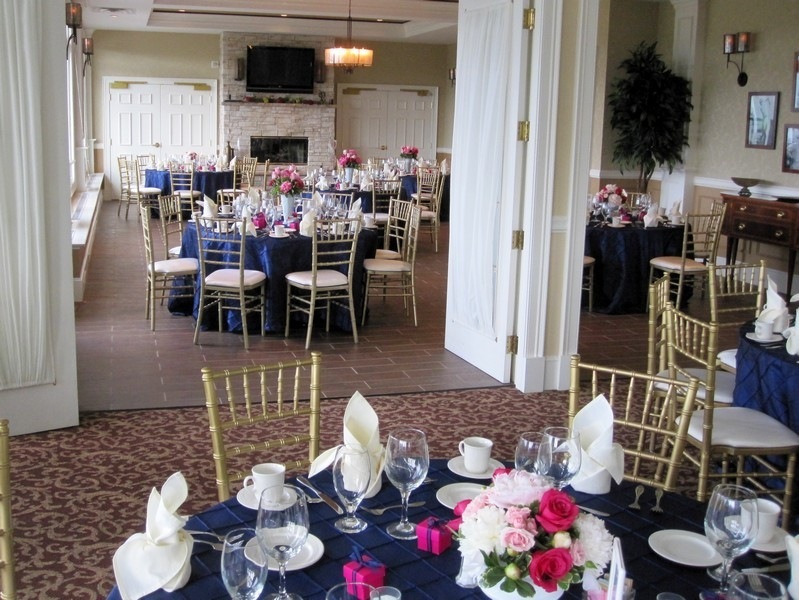 Davenport Country Club, as always, was exceptionally elegant, and underwent some renovations over the winter to give the venue a new look. Jamie and Andrew were an excellent couple to work with; very friendly and photogenic! Jamie looks lovely after exiting from the luxury Quad City Trolley bus. 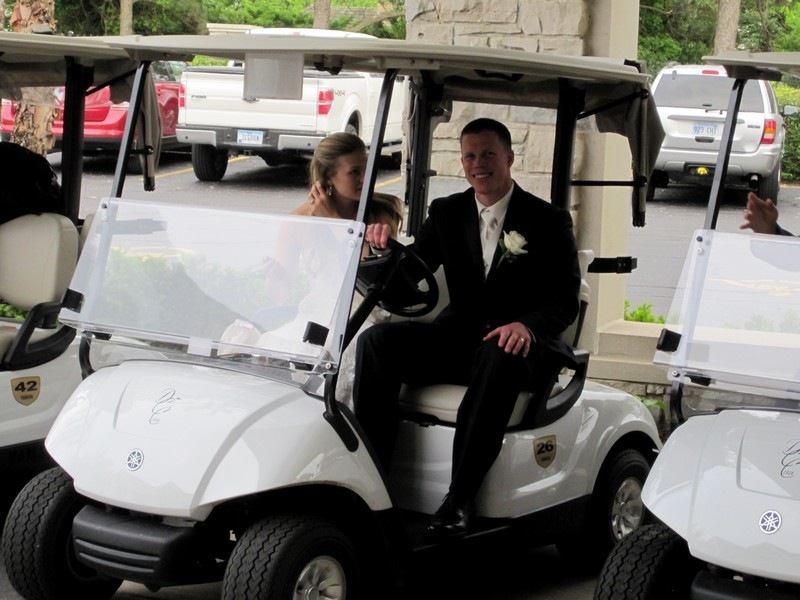 Andrew looks excited to be able to drive his new bride out to the golf course for photos. And what a beautiful day! Family style head table looks great in front of the fireplace, with table coverings and chairs from Tita’s Linens in Davenport. 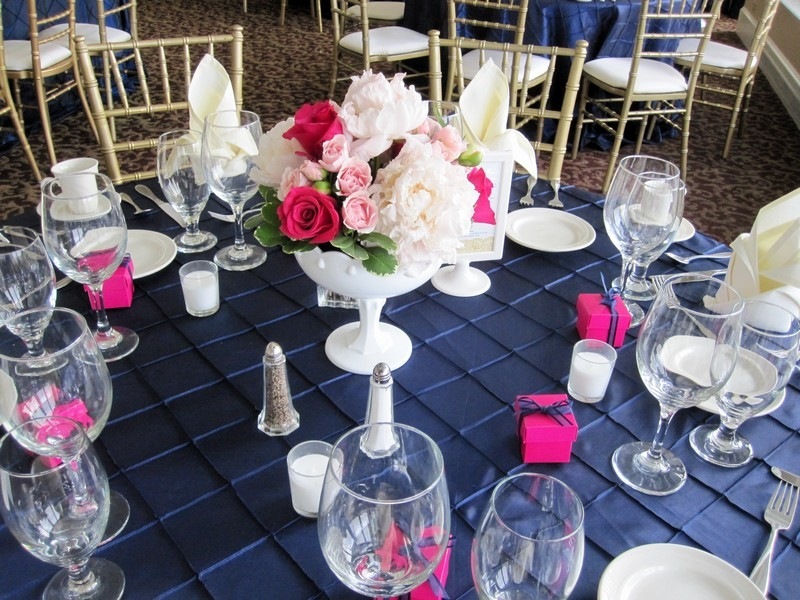 Table settings in the couple’s colors of Navy, Gold and Hot Pink. 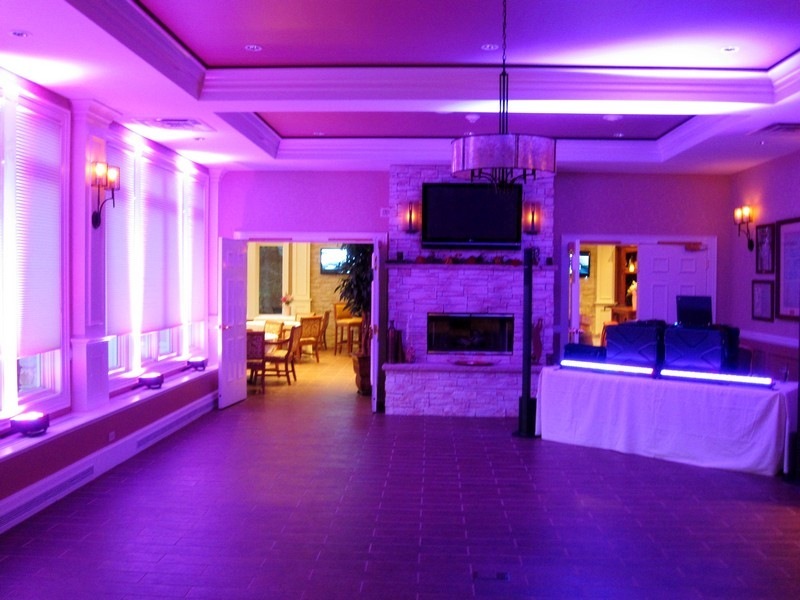 A view into the Country Club’s renovated East Wing room. Added were a new floor and widescreen TV over the fireplace. 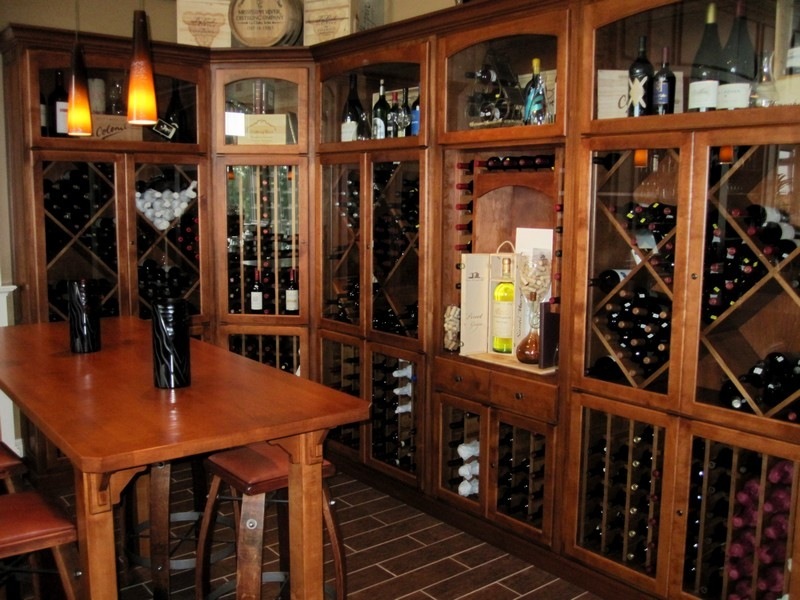 Guests were able to enjoy the newly added wine cellar decor in the club’s elegant bar area. Our equipment set up was directly in front of the band. 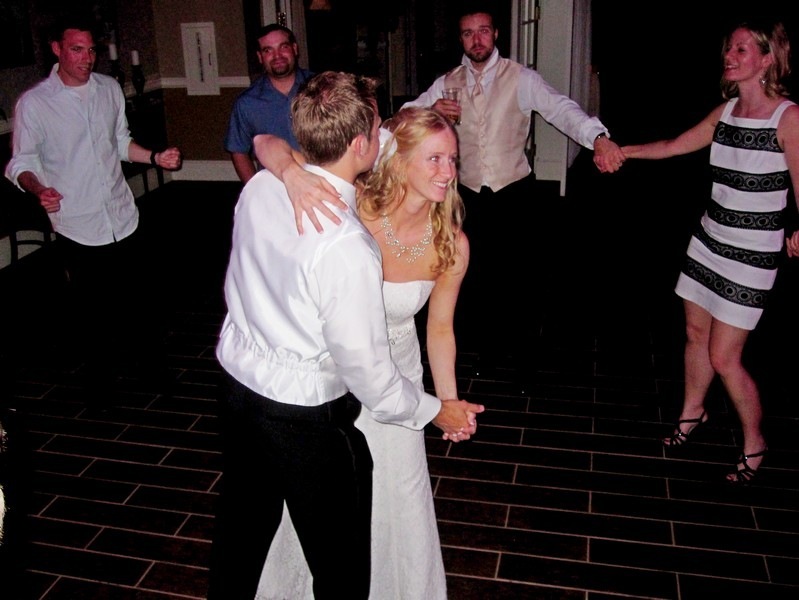 Jamie and Andrew had their first dance around 8:40PM and danced to “At Last” by Etta James. When I finished my set at 9 PM we had our equipment and table removed within a few minutes so the transition from DJ to Band barely missed a beat! 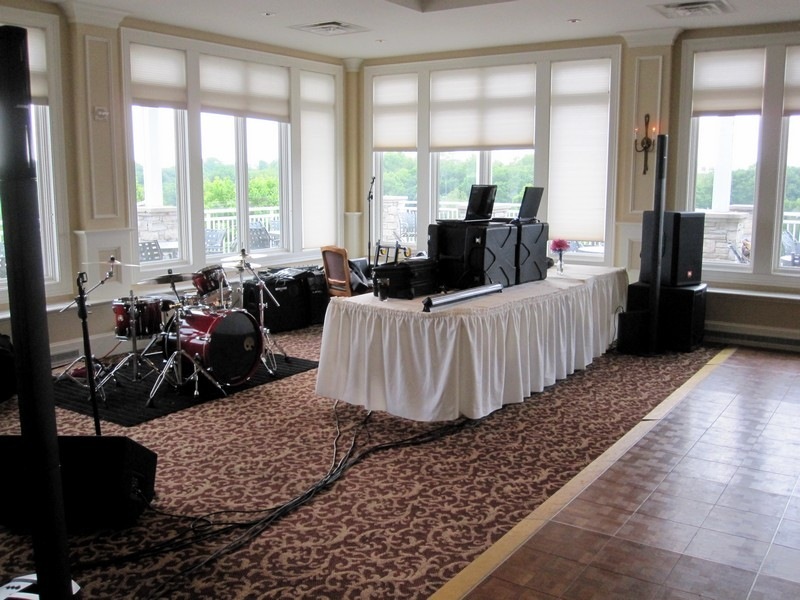 DJ and Band setup area near the dance floor. The head table enjoys dinner! 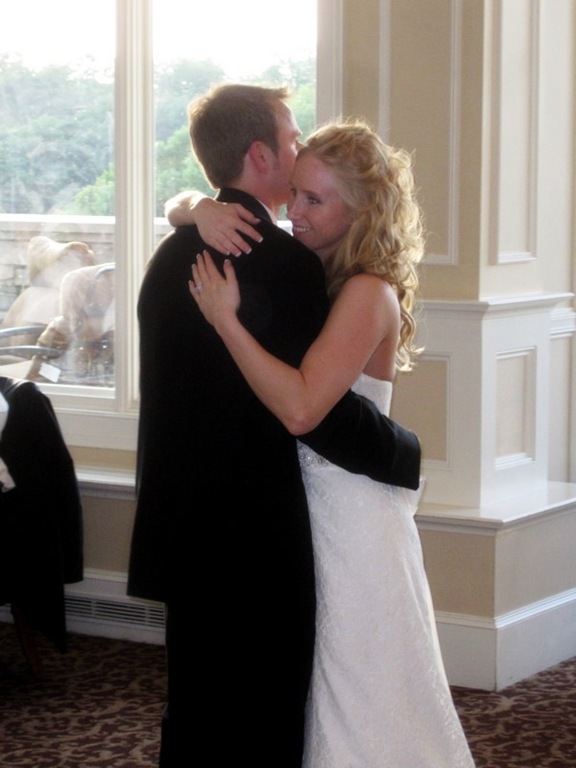 Jamie and Andrew enjoy a moment during their wedding reception. They are a truly photogenic couple! 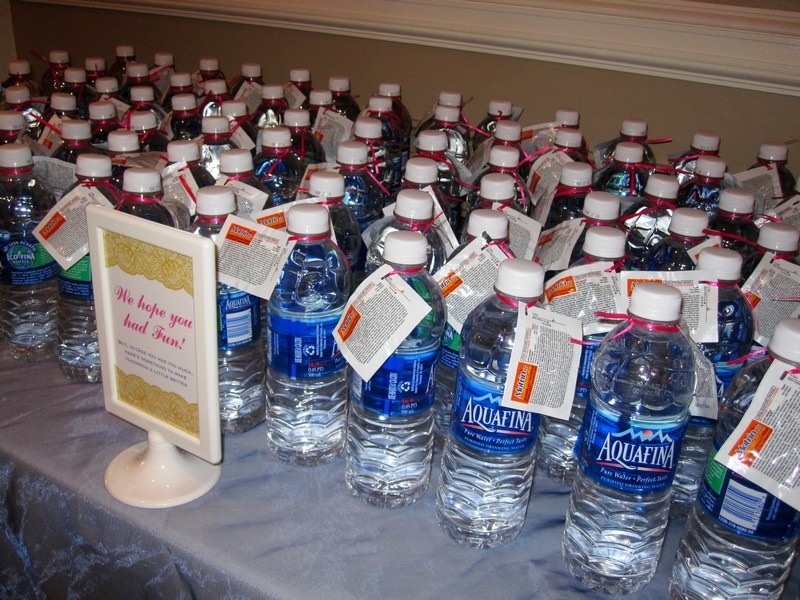 For those who partied too hard – water and Motrin! Thank you and congratulations to Jamie and Andrew! We wish you the very best as you begin your new adventure together. 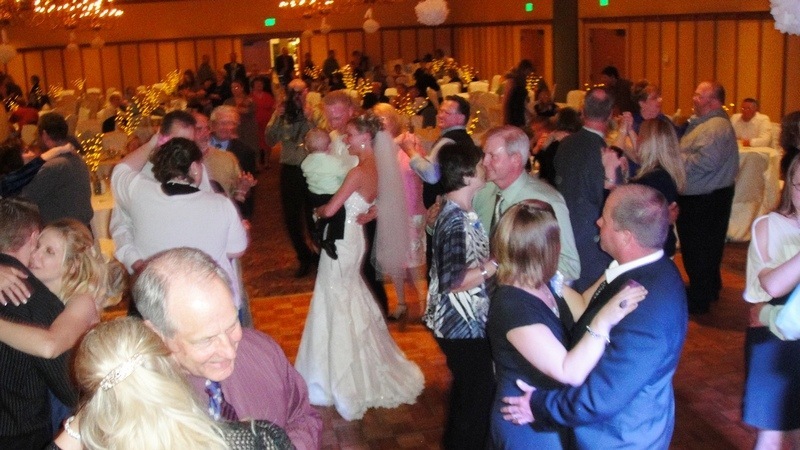 Wedding receptions are all about FAMILY milestones and memories. 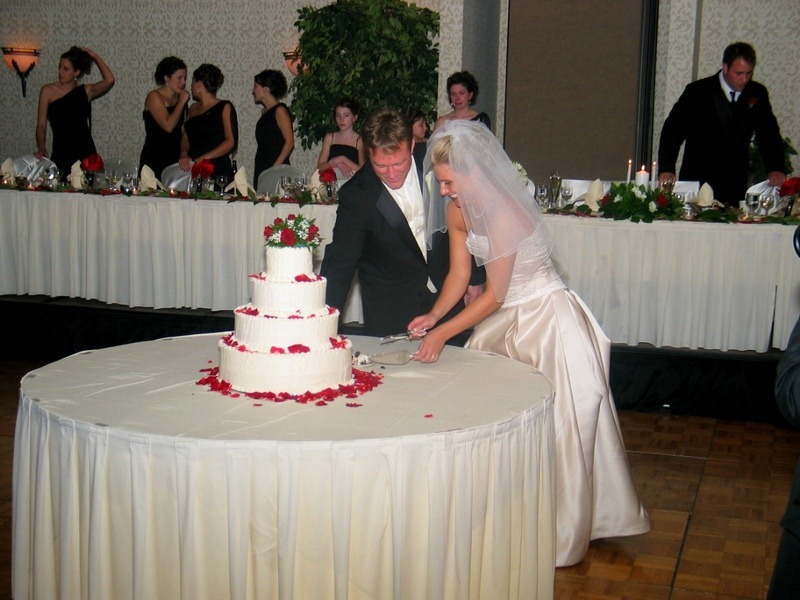 On November 19, 2005 I was first introduced to the Daufeldt Family at the wedding reception of Kelly Hauser, who married Brent Daufeldt. 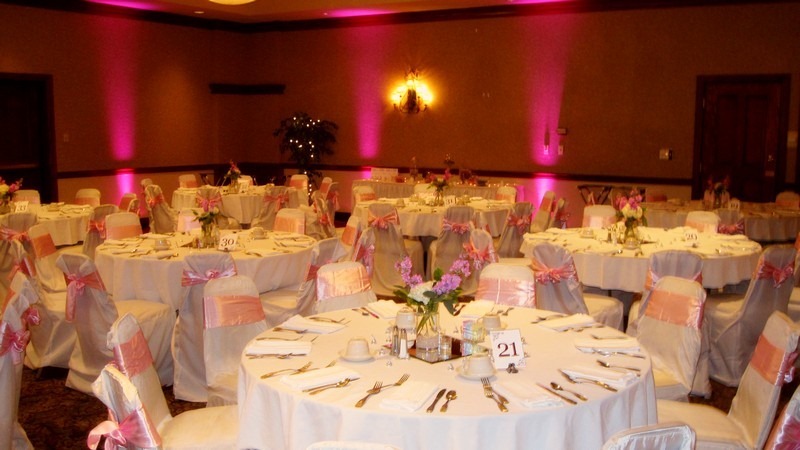 Their reception was in the Radisson Quad City Plaza ballroom. I have a very distinct set of memories from that reception. The setting was beautiful, one of the most beautiful that I recall from that year. But more importantly, Brent and Kelly were an amazing couple, and the guests had an absolutely incredible time that night. 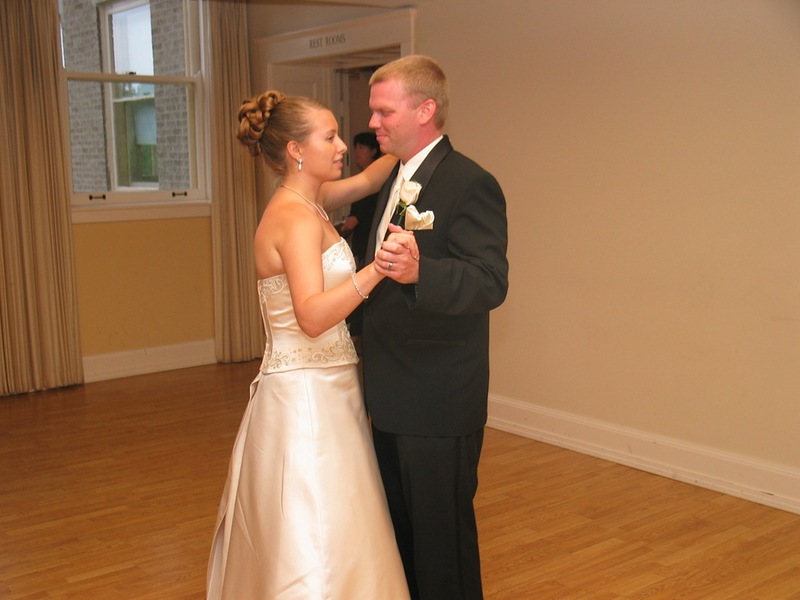 One of Kelly’s bridesmaids was Brenda Daufeldt, Brent’s sister. 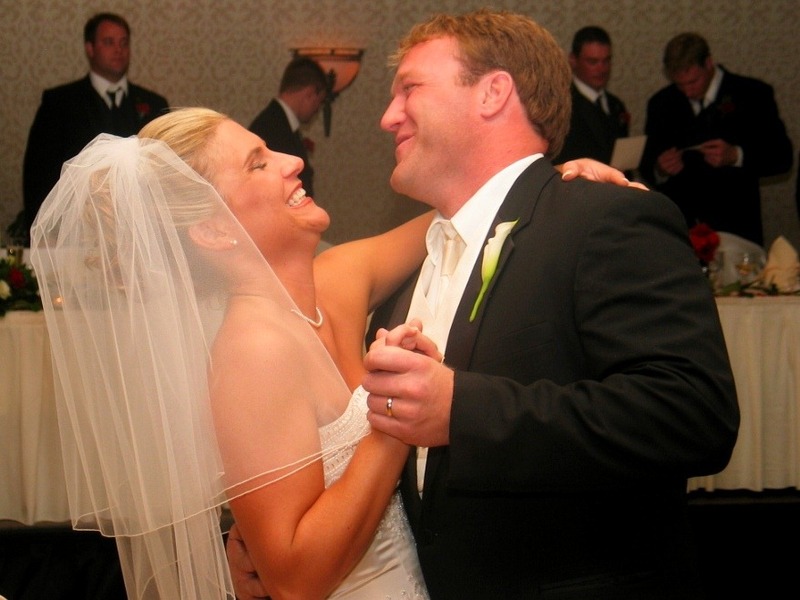 Brenda got engaged to a man named Michael Bany, and on August 26, 2006 their wedding reception was held at the industrially chic Hotel Vitro in downtown Iowa City. I was again honored to be the D.J. at my second Daufeldt wedding reception. 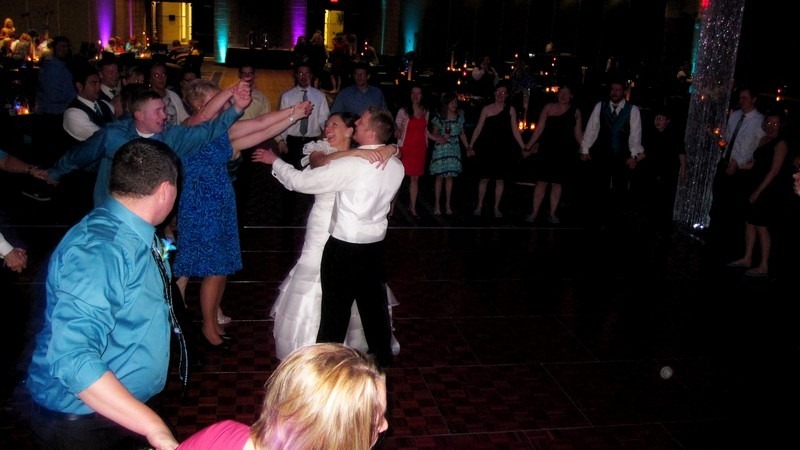 And just like Brent and Kelly’s reception, this was a truly great party! 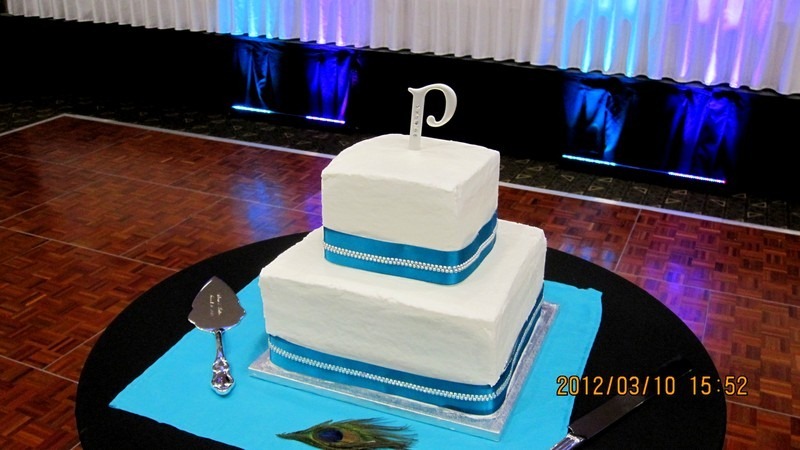 Brenda and Michael’s wedding cake was stunning, the venue was incredible, but again, the families and the guests in attendance were simply the best. I have a very vivid set of memories from that amazing night also! 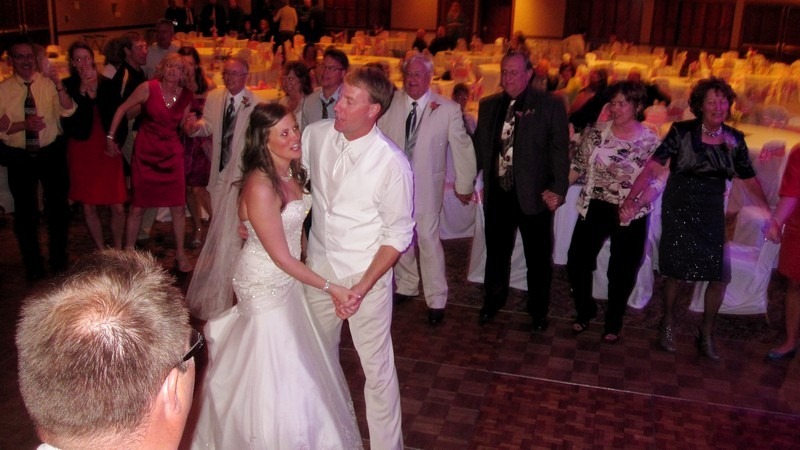 The Daufeldt family loves music, country music in particular, and every song selected for their events were what I would call timeless classics. There were songs from Conway Twitty, Tammy Wynette, The Nitty Gritty Dirt Band, Johnny Cash, The Eagles, Neil Diamond and more. 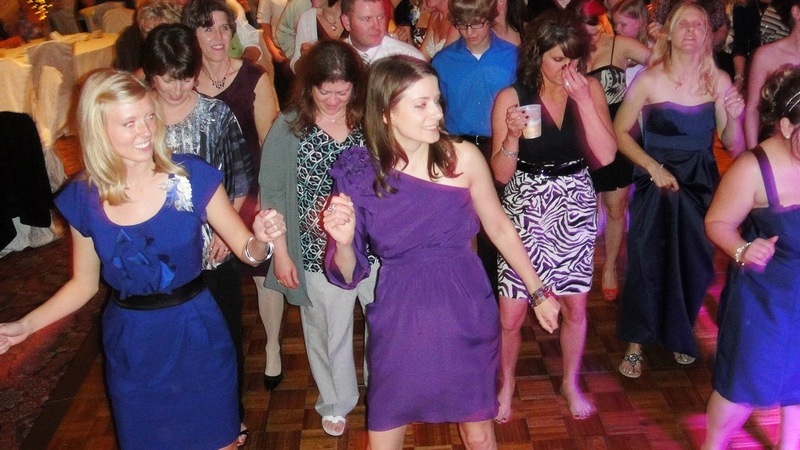 That makes for a really fun time on the dance floor! 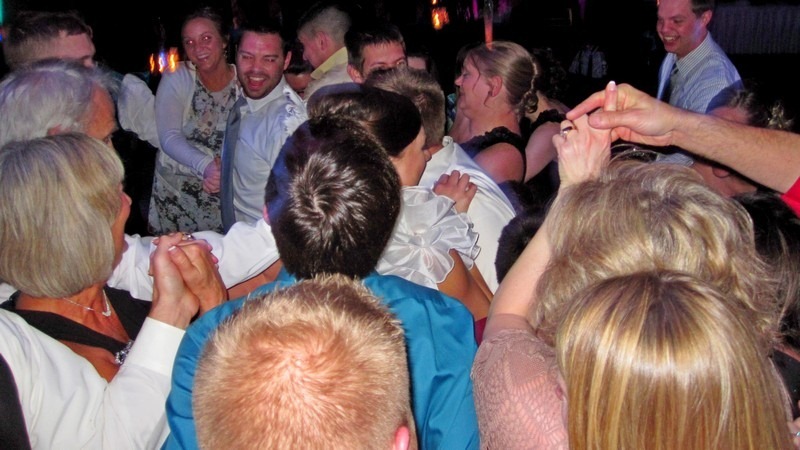 One of the men in Brenda and Michael’s and Kelly and Brent’s wedding party was Brad Daufeldt, the youngest brother in the family. We were thrilled when he contacted us to announce his upcoming wedding! The date was to be April 21, 2012 at the Clarion in Iowa City. There is nothing more heart warming to see the same fun-loving family, after almost six years, getting together to celebrate another family milestone! There have also been a lot of little additions to the family! Flower Girl and Ring Bearer’s had been practicing their photo posing, and were really good at it by the time they got to the reception! 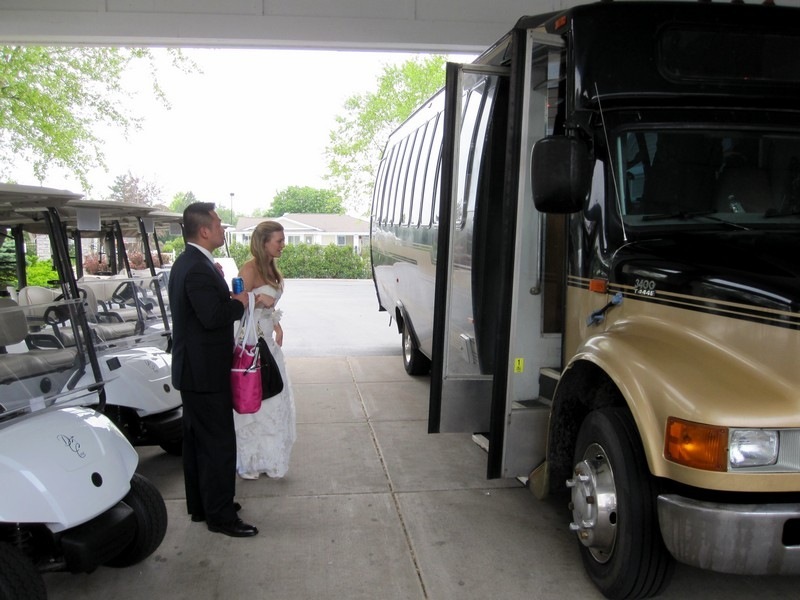 Audra and Brad had around 350 guests looking forward to welcoming them when they arrived at the Clarion for their grand entrance around 5:45 PM. 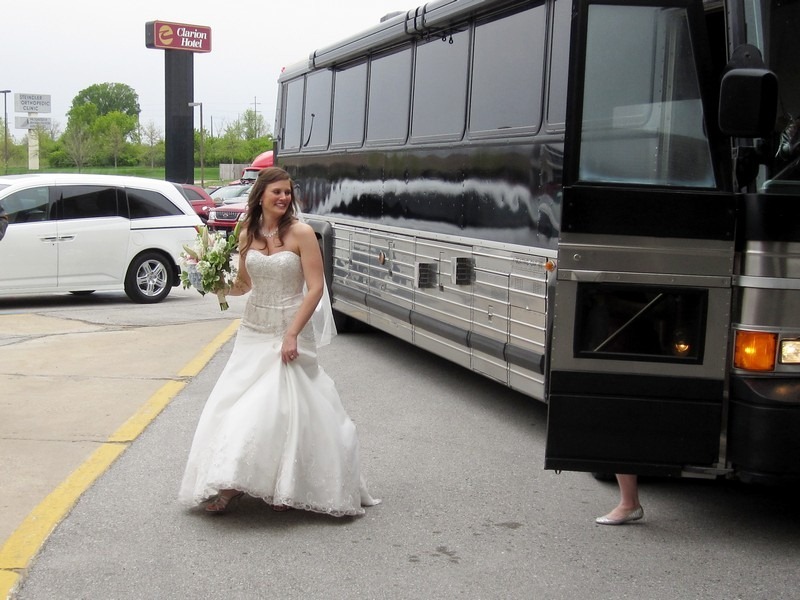 Audra arrives in style in her private tour bus! 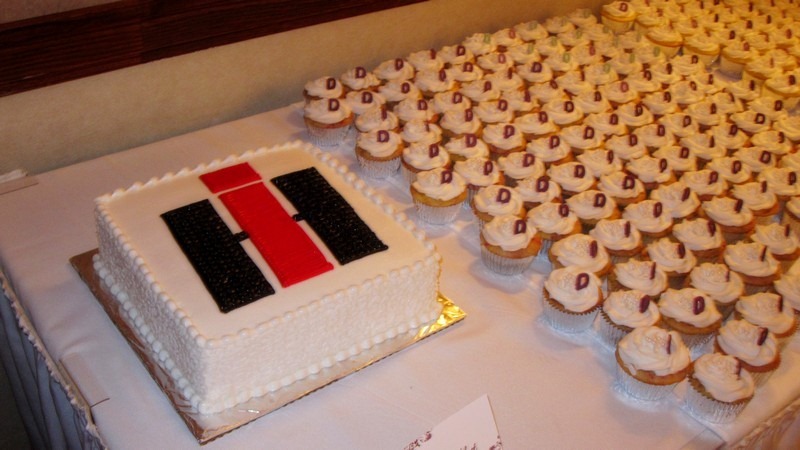 Brad’s wedding cake with the familiar IH logo. 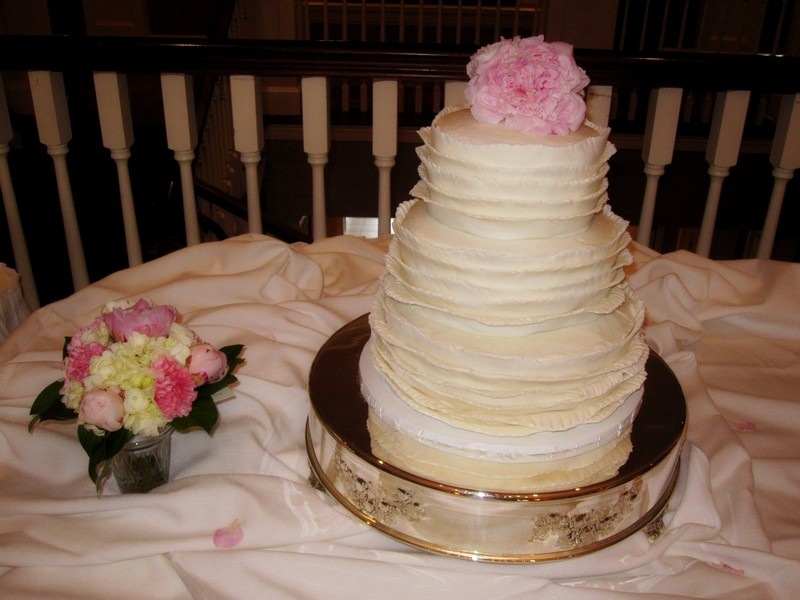 Brad and Audra’s beautiful wedding cake. 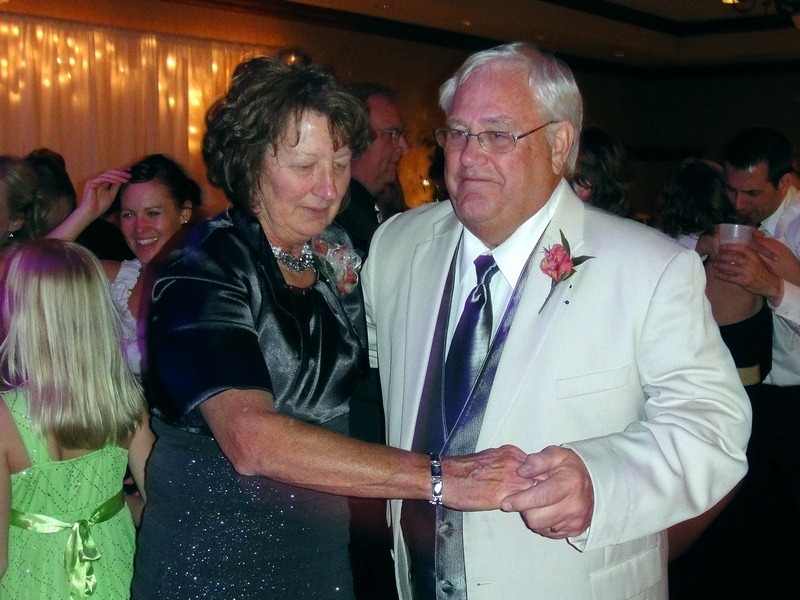 When the music was over and the dust was settling, it was a privilege for us to again say farewell to Don and Pat Daufeldt, Brad’s parents. 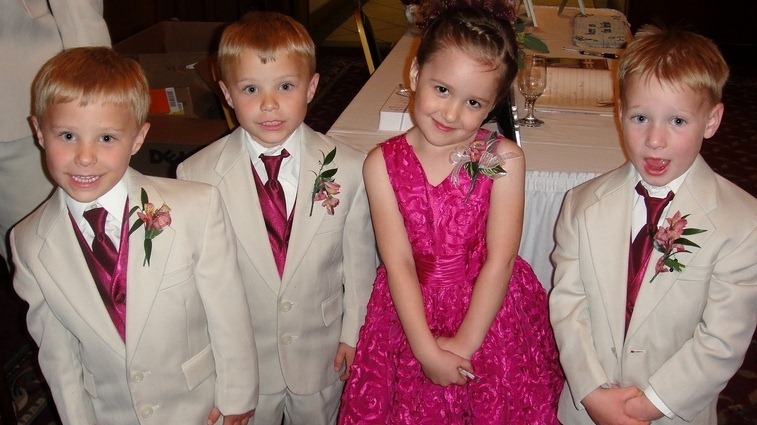 I mentioned to Don that all the children were now married and this would be the last party we would get to do for them. Spoken like a true family man. 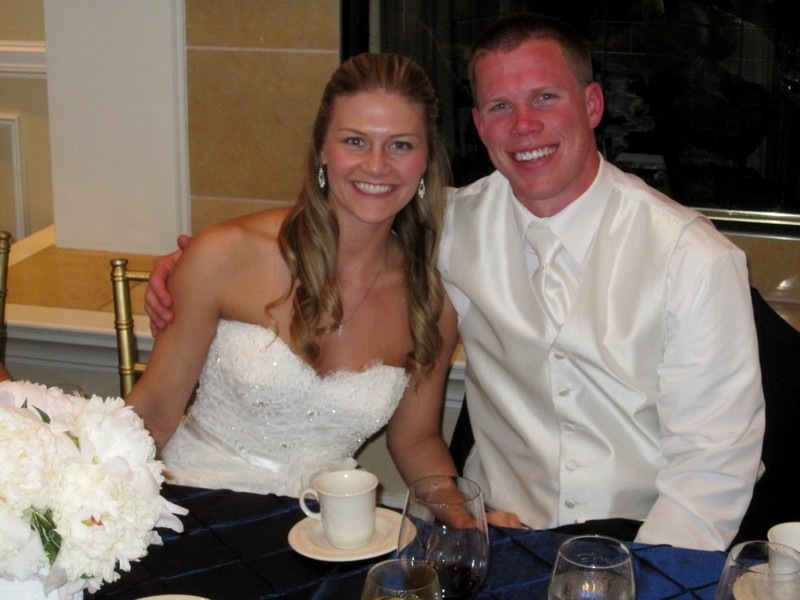 Congratulations to Audra and Brad, the Grieves and Daufeldt families, as you all begin a new chapter in your lives. And again, thanks to the Daufeldt family for sharing your children’s milestones with us. I am sure you will cherish the memories, as will we. 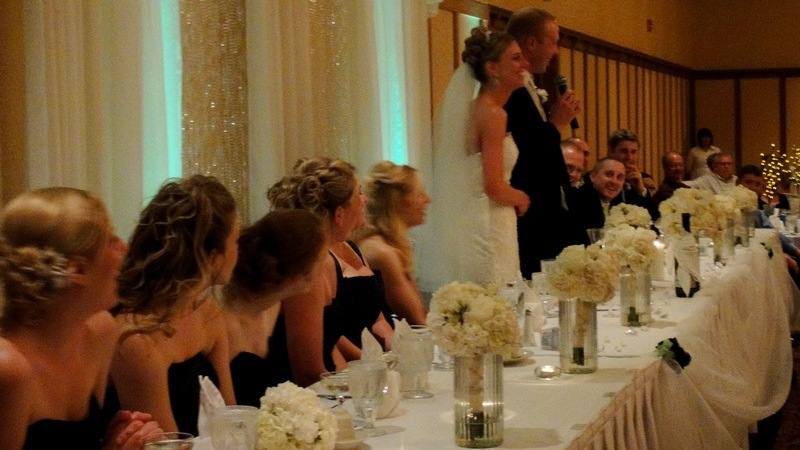 We first met Ryan Wood and Kelly Youngren at the wedding of Abby and Jeff Fobert that we worked back in June of 2011 at the Radisson Hotel. Soon we were making plans to entertain at Ryan and Kelly’s wedding reception at the beautiful Mozart room at the Lodge Hotel in Bettendorf. 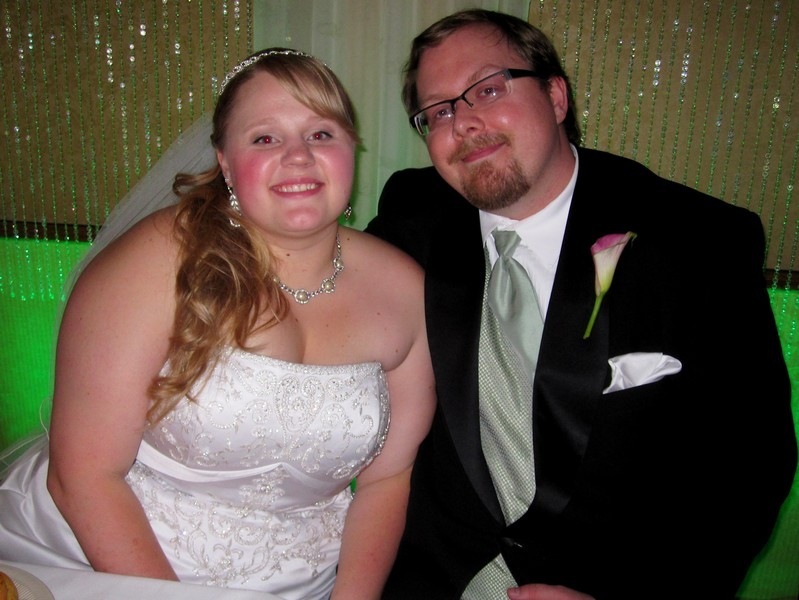 Ryan and Kelly had a great day for their wedding ceremony in Woodhull Illinois. 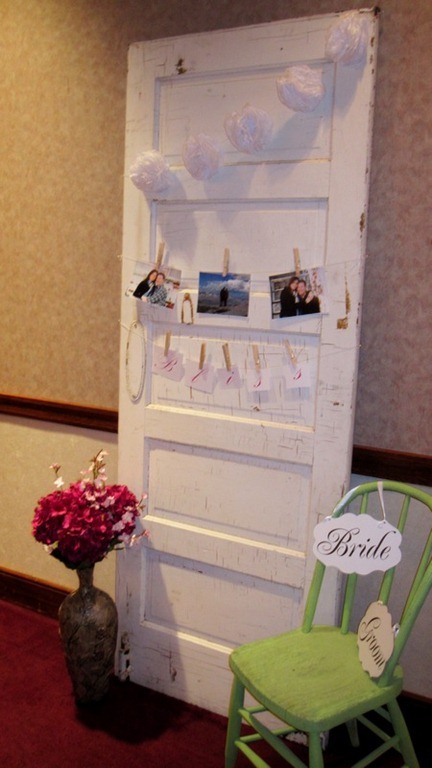 Their guests began arriving at the Lodge around 5:45 PM and the wedding party arrived shortly thereafter. 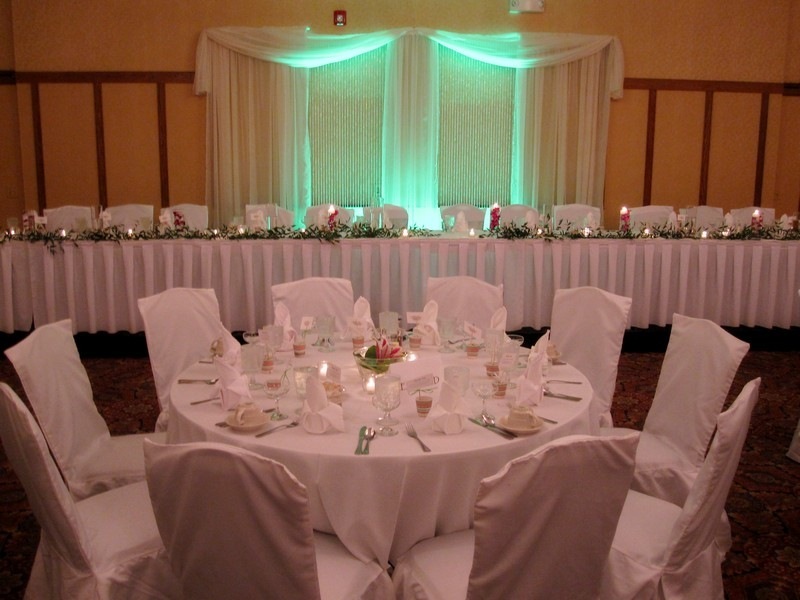 The Mozart Room was decorated in the colors of Lime Green and White. 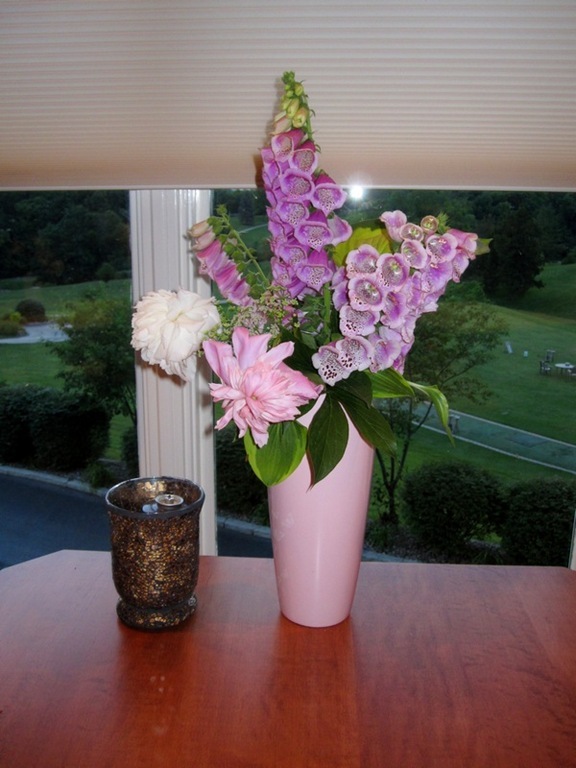 Flowers were furnished by Beyond the Garden Gate in New Windsor. 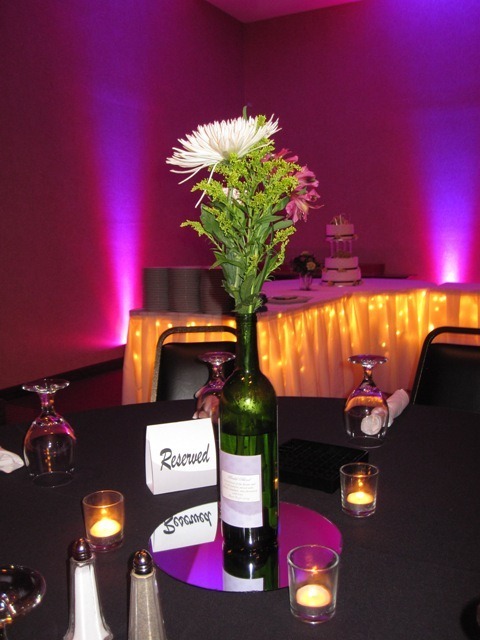 Our Focal Point Uplighting package was used behind the head table to match the Groomsmen’s vests and ties, which were Lime Green. 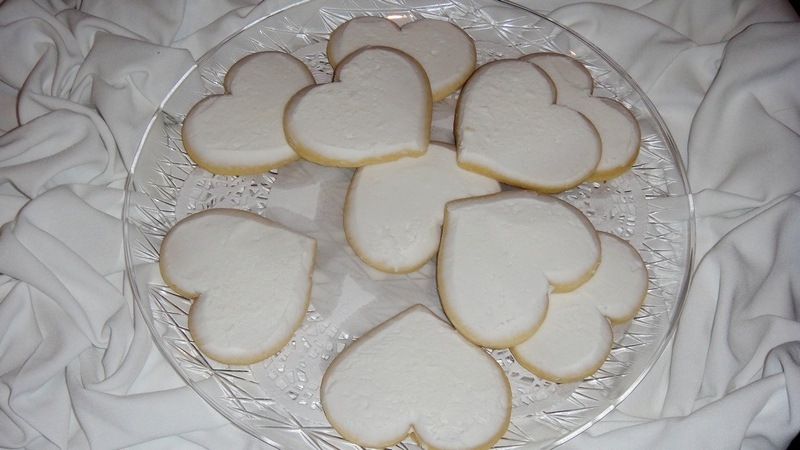 Excellent Sugar Cookies! My Favorite Thing! 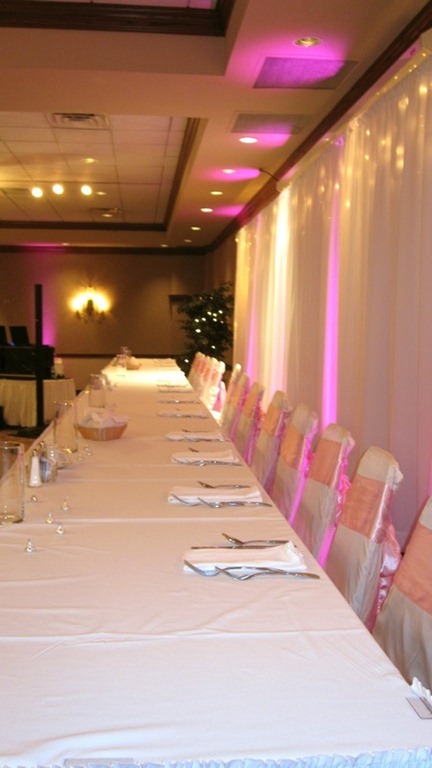 Beautiful head table awaits the wedding party! 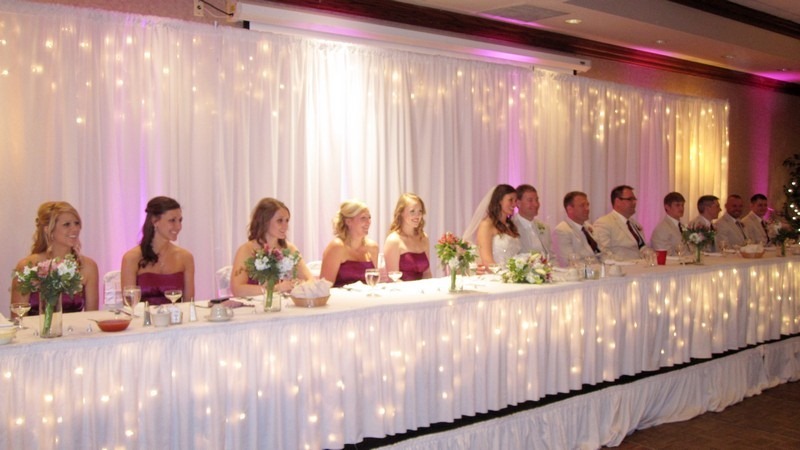 Ryan and Kelly's place at the head table. 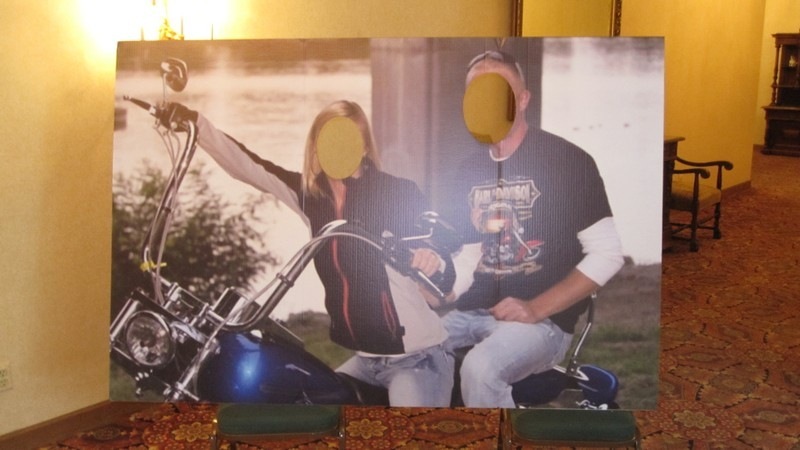 This very creative place for a photo op was placed in the atriume near the entrance to the banquet room. Ryan gives a great welcome speech! 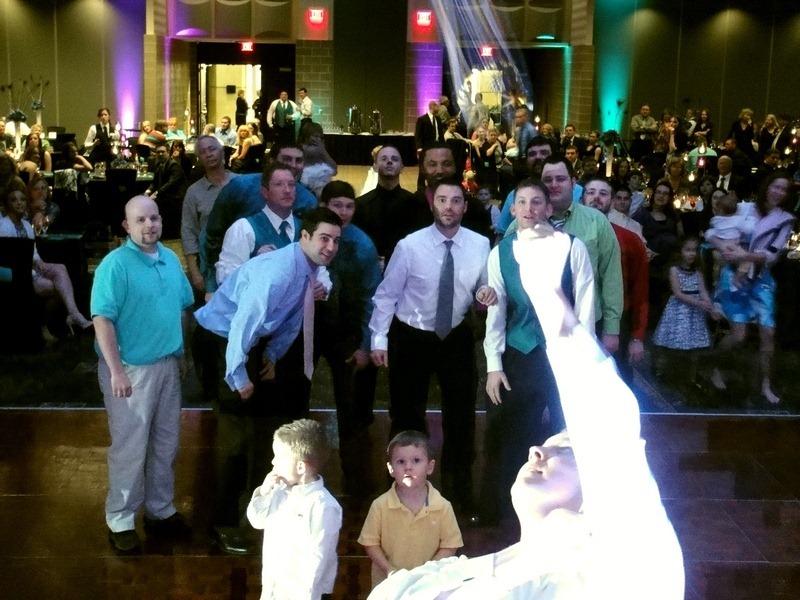 Evan Wood auctions off the garter. 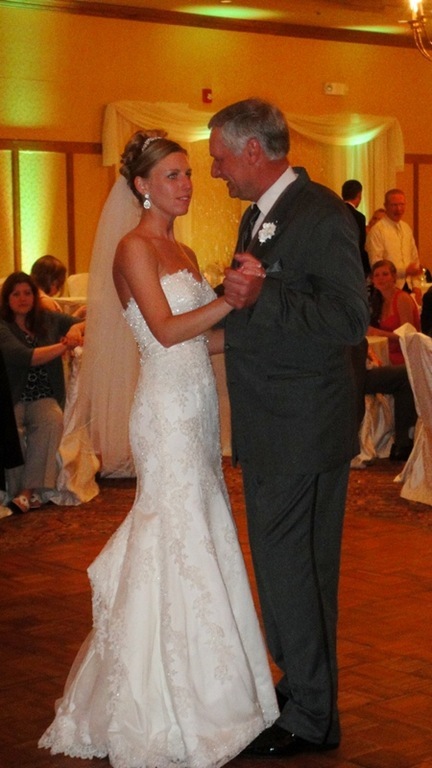 Kelly dances with her Father, Larry. Donavan and Diana Wood, parents of the groom. 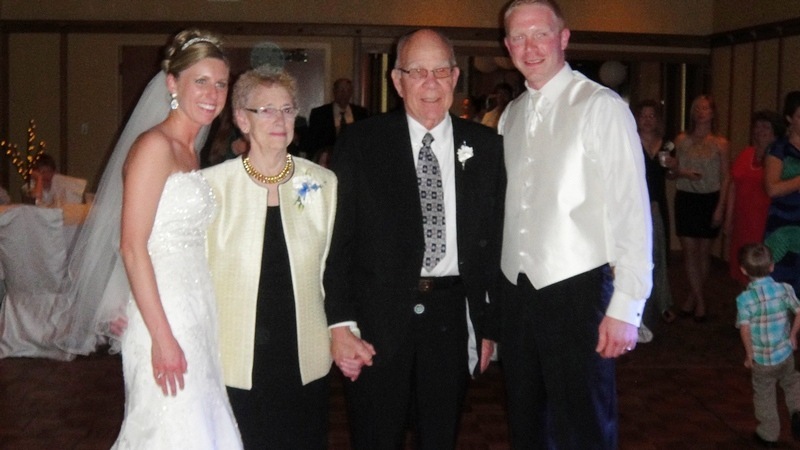 Mr. and Mrs. Bill Burton, Ryan's Grandparents and winners of the anniversary dance share a moment with Ryan and Kelly. 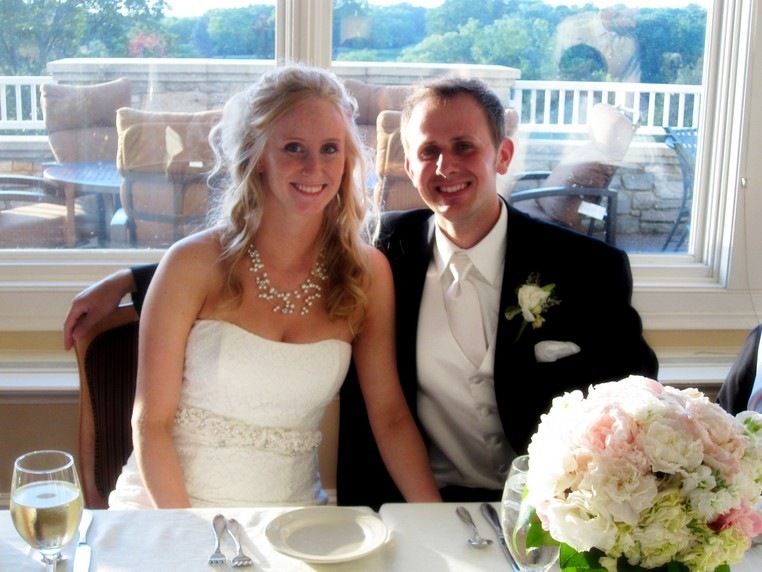 Thanks Kelly and Ryan for letting us share in your special day! We wish you the very best in your new life together! Peacock feathers abounded at Katie and Adam Powers’ Spring wedding and reception held at the shiny and elegant Waterfront Convention Center on March 10, 2012. “Ever since I heard that Katie’s wedding would be on March 10 I have been praying for beautiful weather!” mentioned one of couple’s relatives as we waited for the ceremony to begin. And what perfect weather it was! 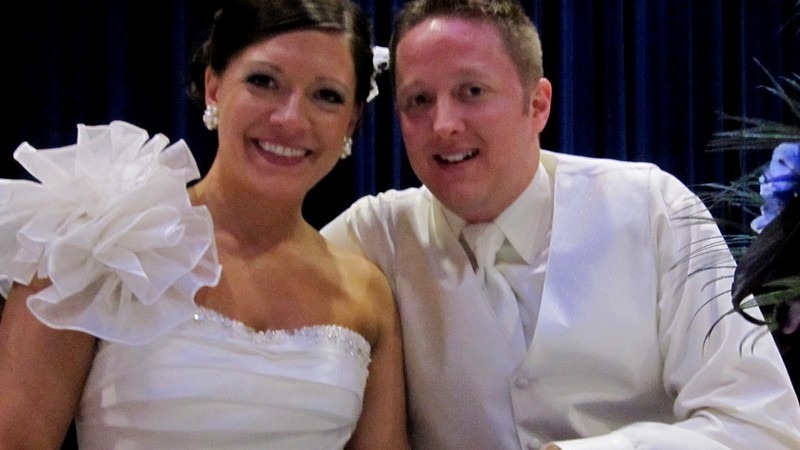 Sunny skies and temperatures in the 60’s are not the norm for the second weekend in March, but then again, this was not a normal day for Katie and Adam! 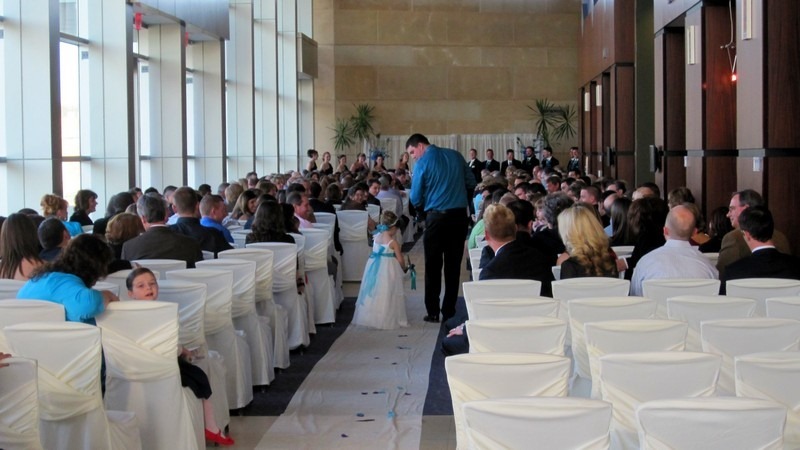 The couple’s ceremony took place in the glass encased atrium of the Waterfront Center, allowing for perfect views of the beautiful day outdoors. 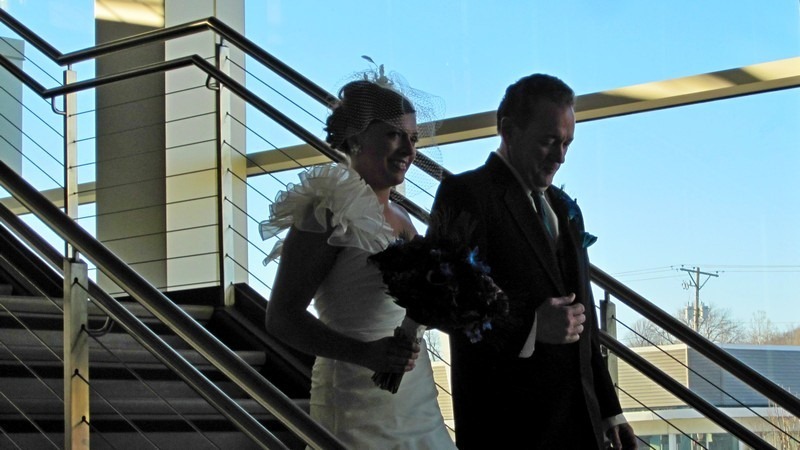 Katie was a beautiful bride as she descended the grand staircase and made her entrance to Purcell’s “Trumpet Voluntary”. 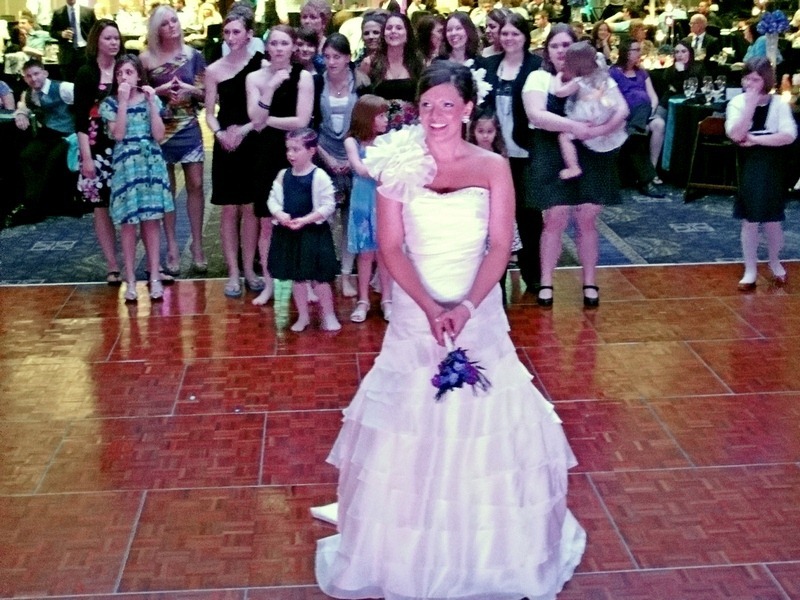 Elizabeth, the Flower Girl, makes her way down the long ceremony aisle. Katie descends the grand staircase, escorted by her Father. After the ceremony the couple’s 350 guests enjoyed appetizers and cocktails in the West Atrium. We furnished some upbeat cocktail music using one of our BOSE wireless systems to help make the hour more festive! 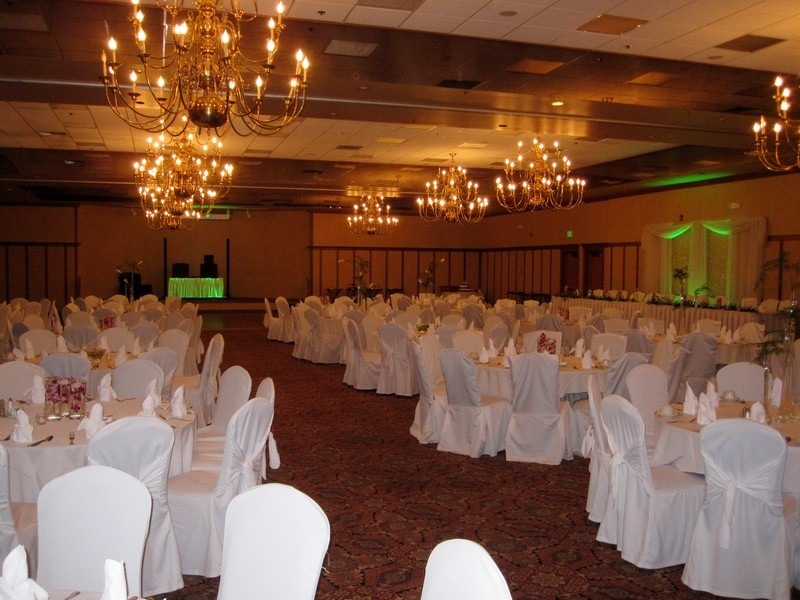 The facility’s grand banquet room was opened to the guests at 6:30. 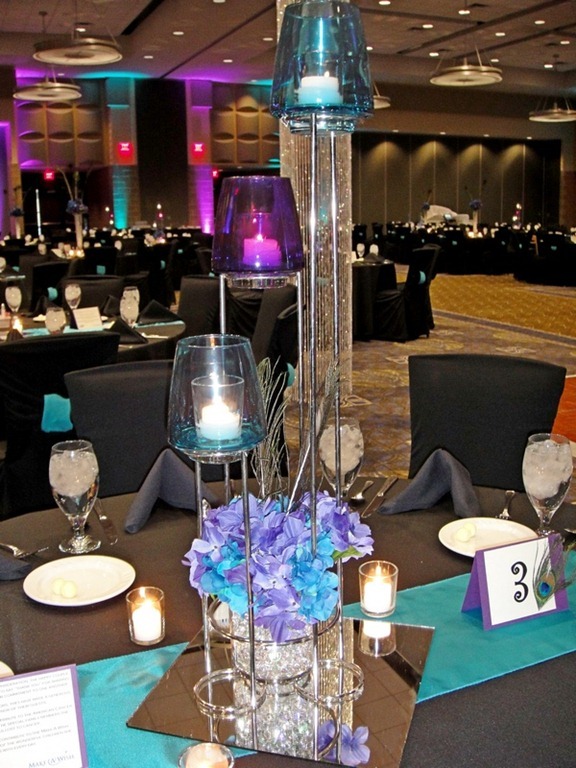 Guests found the room to be beautifully decorated in the couple’s peacock theme, including turquoise and purple flowers, peacock feathers, black linens and chair covers with turquoise sashes provided by Clazzy Designs. 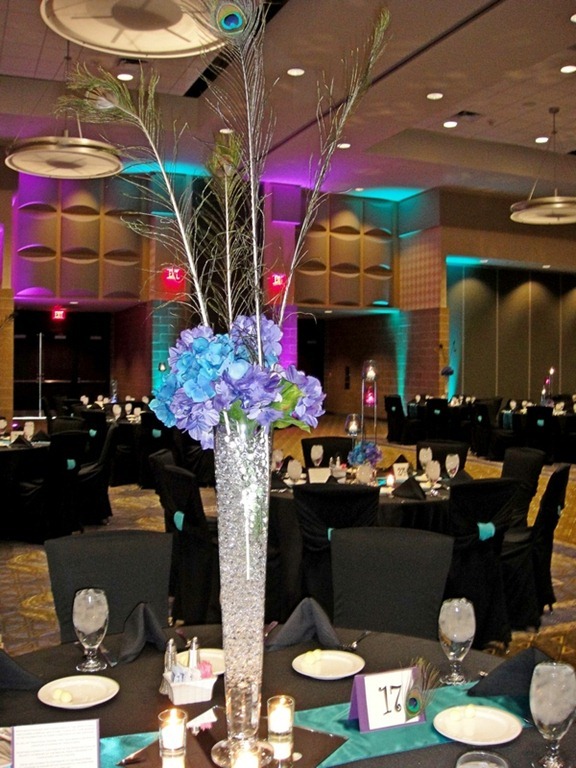 We enhanced the theme with up-lights in turquoise and purple throughout the room. Katie furnished us with some color swatches so that we could custom match her color scheme and program our up-lights prior to the event. 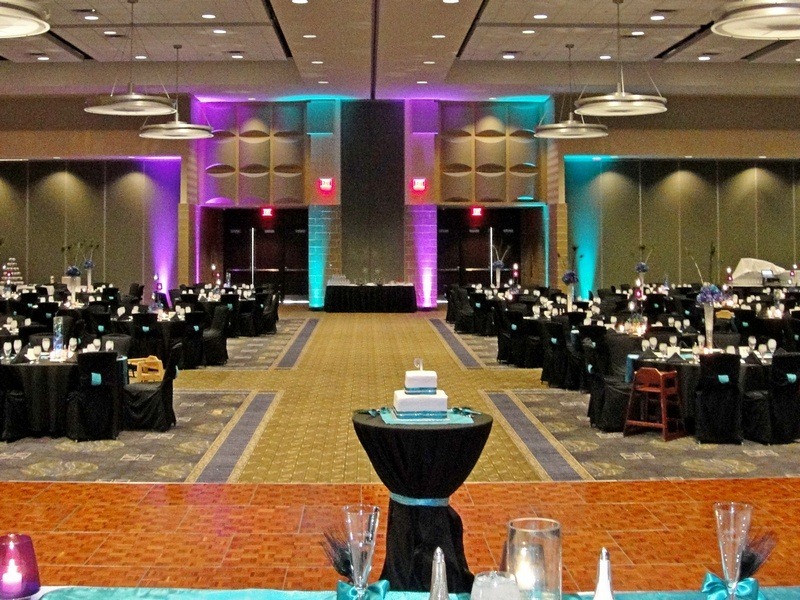 Black Tie provided turquoise and purple uplighting to accentuate and enhance the peacock theme. 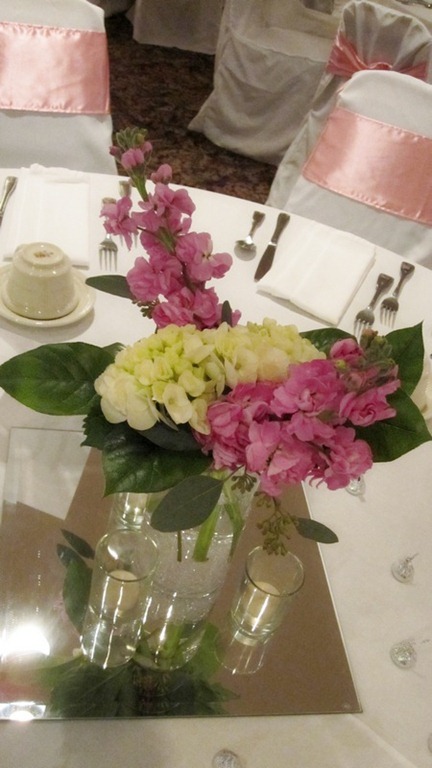 Floral and decor by Clazzy Designs. Peacock, purple and turquoise table settings and uplighting. What a beautiful setting for a party! The newlyweds made their grand entrance, along with their large wedding party, to the song “Marry You” by Bruno Mars. 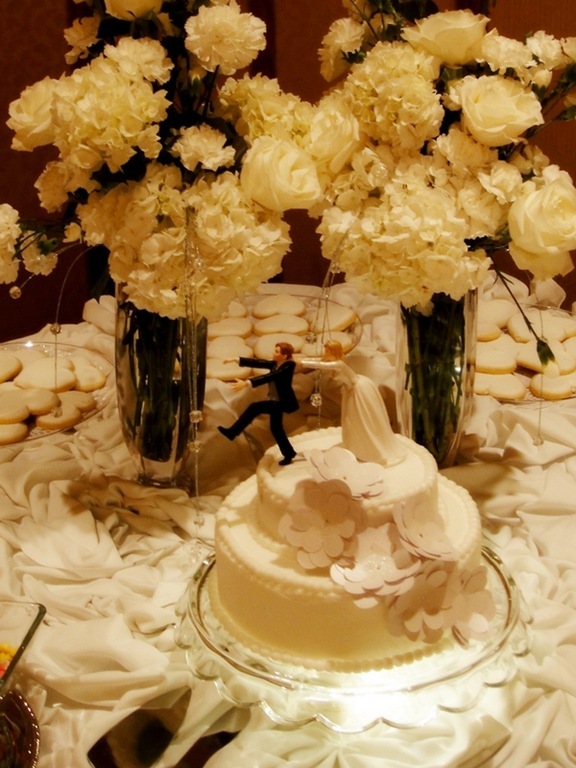 The couple cut their wedding cake which was centered on the dance floor, immediately to kick off the festivities. 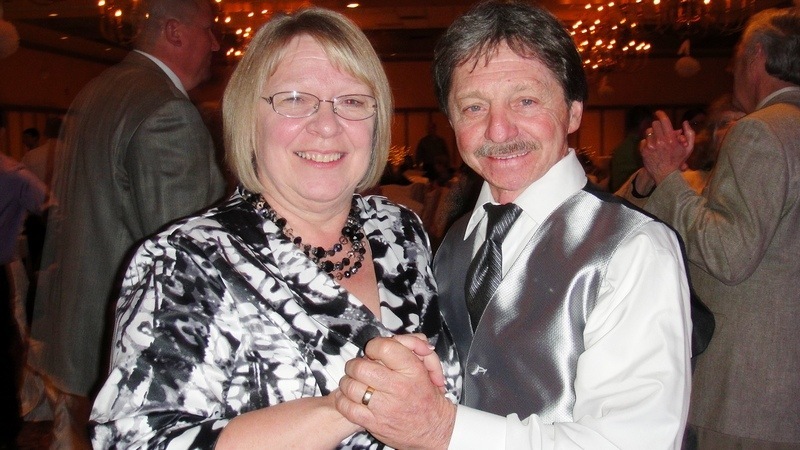 There was a welcome speech by the Father of the Bride, Mike Snyder, and a blessing by Pastor Lynn Thiede. 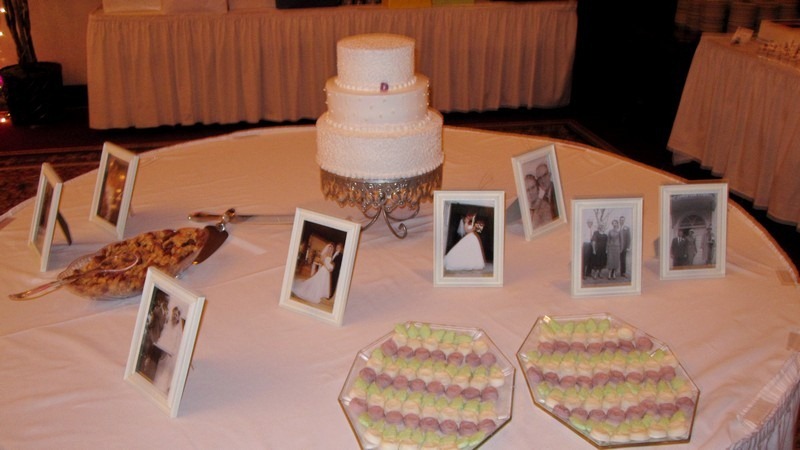 Guests enjoyed a video montage as the dinner buffet began. After dinner Katie and Adam kicked off the dance floor fun by dancing skillfully to “Can’t Help Falling In Love” by Elvis Presley. 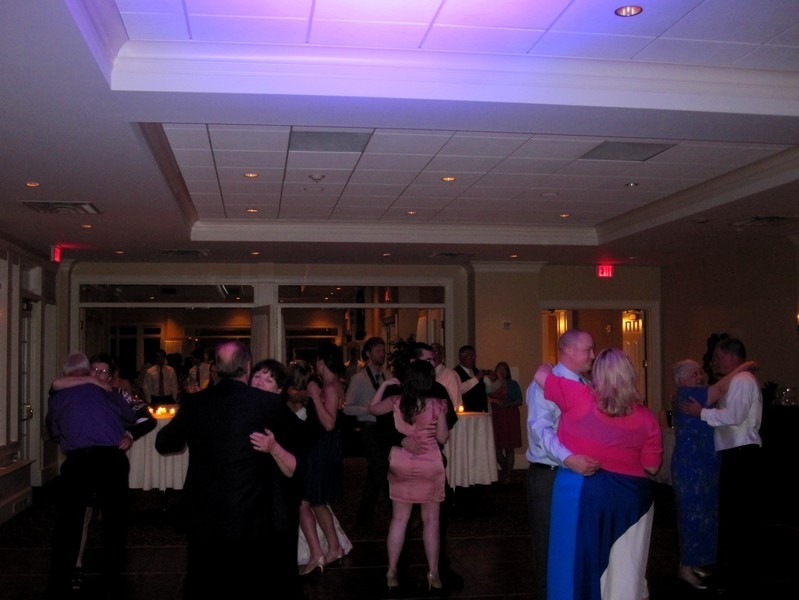 As you can see, the party was great and the guests really used the dance floor to it’s fullest! 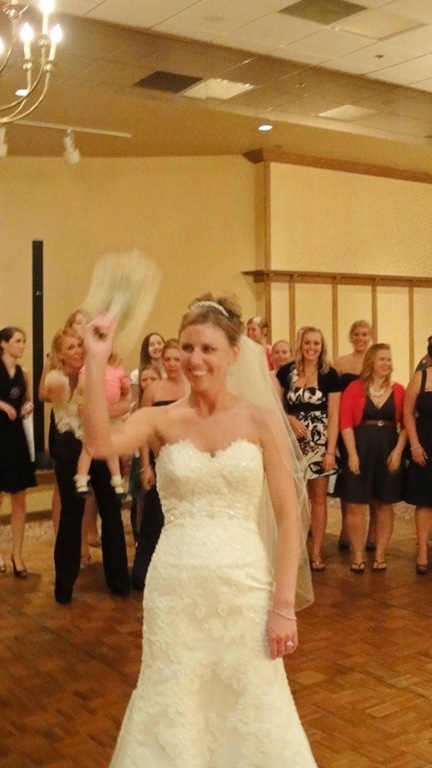 Katie gets ready to toss the bouquet. What a beautiful wedding dress! 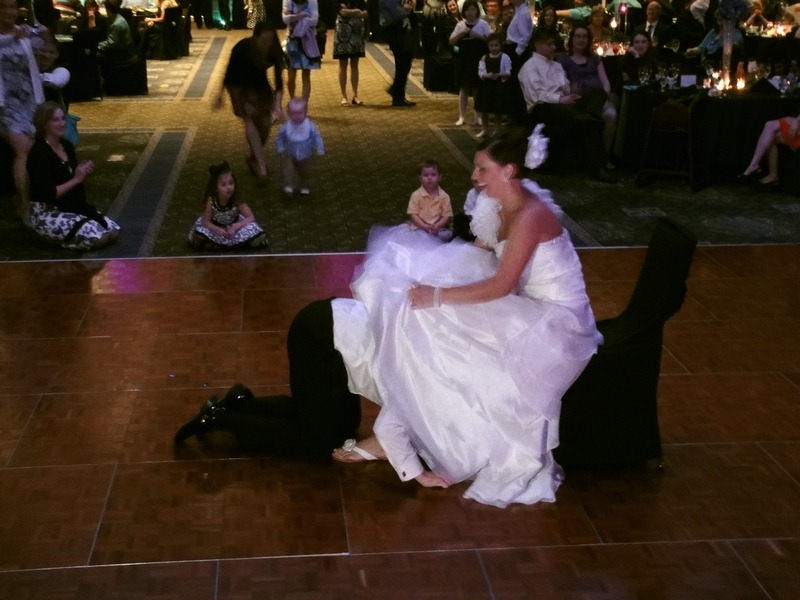 Adam goes for the garter! 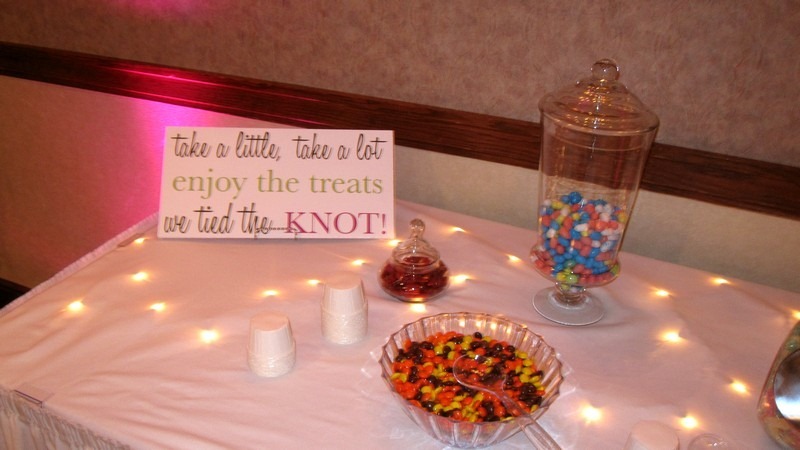 Please visit our Facebook page, www.facebook.com/BlackTieEntertainment for more photos of the party! 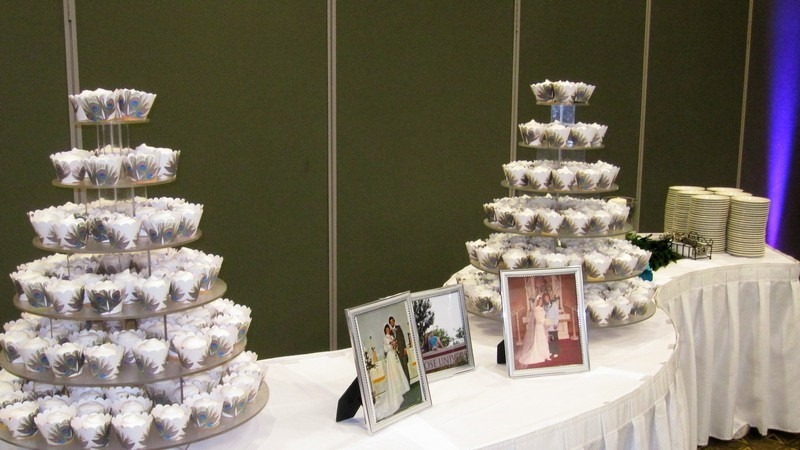 Wedding cupcake tiers from Hy-Vee. Thanks to Katie and Adam for letting us share in your incredible day! We wish you the very best! 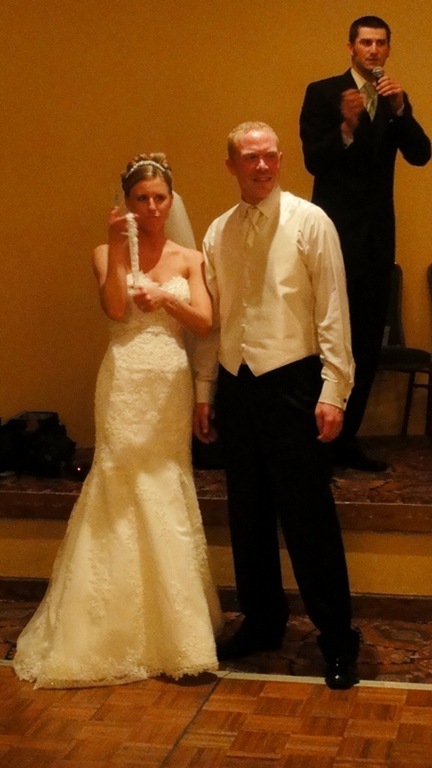 Our 2012 brides are awesome, and we at Black Tie think they are worthy of “Rock Star” treatment. Every year we explore new ways to make our brides’ events more elegant, exciting and memorable, and this year is no exception. So we are happy to announce that we have added a complimentary Focal Point Up-Lighting feature to our Signature Wedding Packages for 2012. 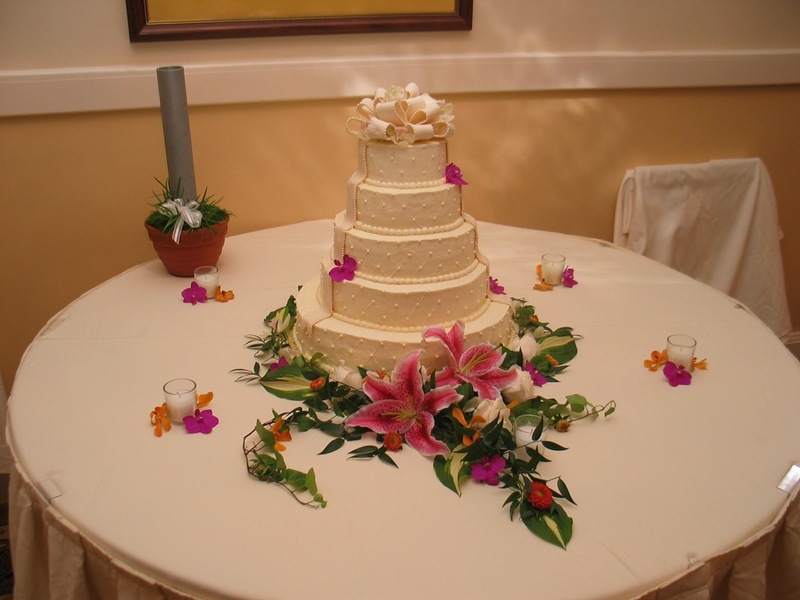 This feature is now offered (free of charge) to all Signature wedding events this year, even if we weren’t offering the option when you booked your event! 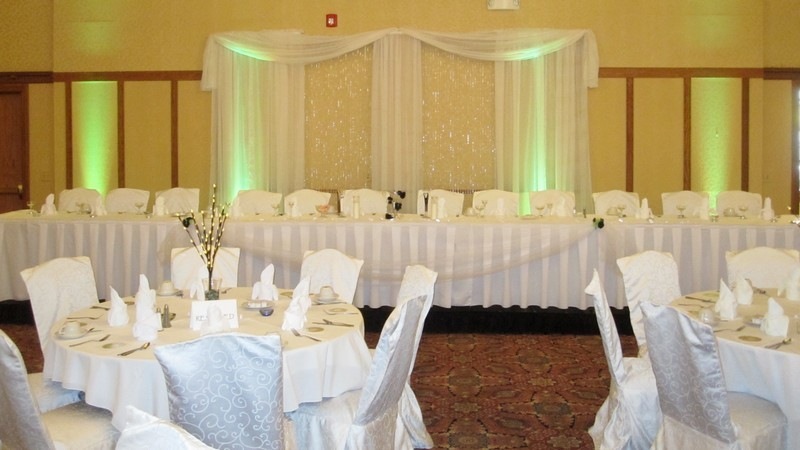 The Focal Point Feature means that we will up-light any particular area of your event you wish to highlight, in the color of your choosing. 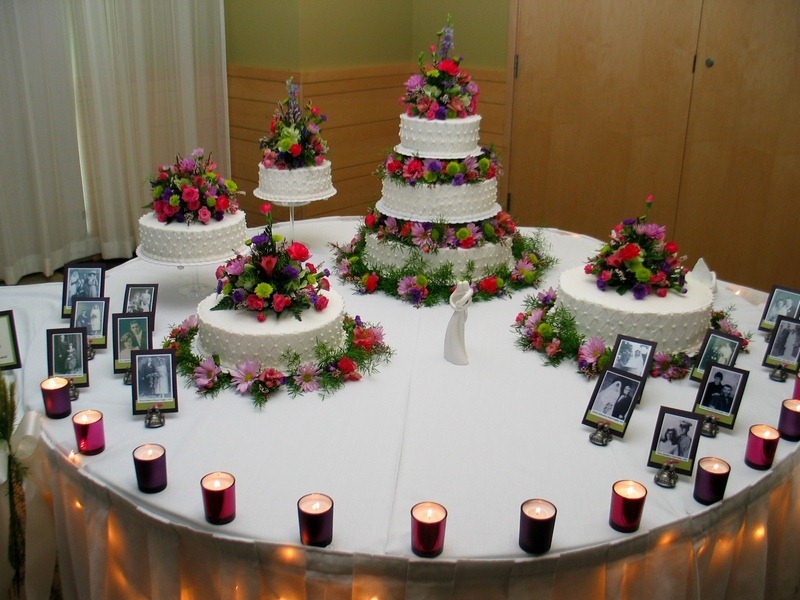 Many will choose the head table area, but other options include the wedding cake area, dance floor, buffet, you name it! 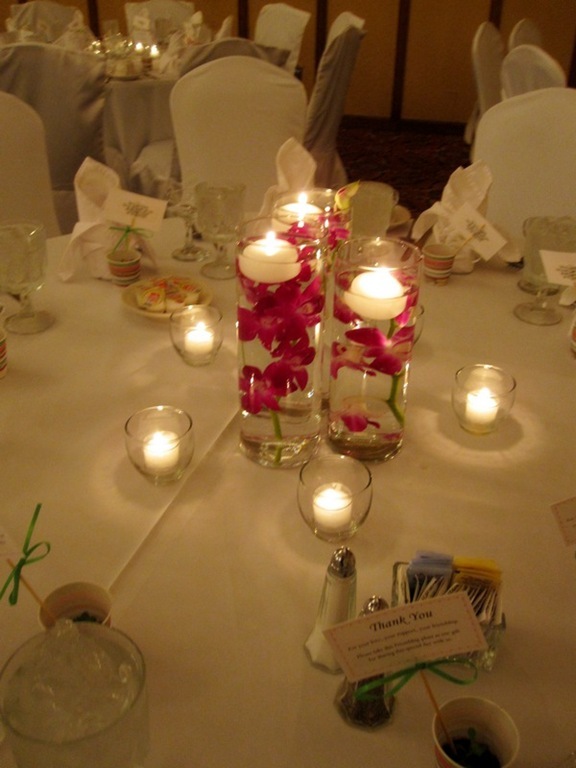 With this starter package it now becomes even more economical to light your entire venue if you so choose. We make it easy for you! One thing that sets our Focal Point Feature apart is the enhancement of our newer up-lighting fixtures. Most fixtures create a particular color by mixing the primary colors of red, green and blue. 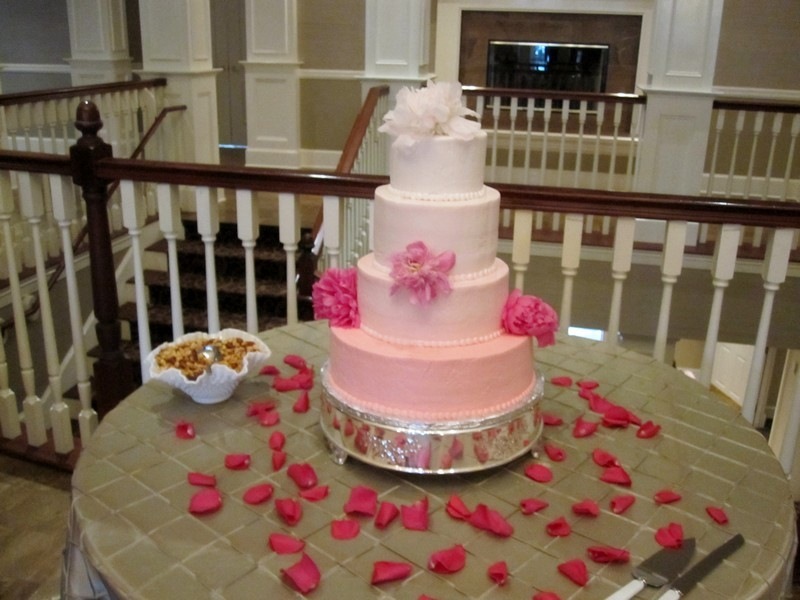 Almost all popular wedding colors can be simulated with a mixture of these three. However, some colors, such as orange, pink, and white are difficult to reproduce with just these three colors as a base. White can be accomplished, however the result is a very cold, bluish shade of white. Our new fixtures simulate colors with the standard Red, Green and Blue L.E.D.’s and add a fourth color, Amber, to the mix. With the addition of this color we can now create a warmer shade of White in addition to the popular wedding colors like Honeysuckle Pink and Tangerine Tango. These are all much more realistic when mixing 4 colors instead of 3. We have also added some battery powered light fixtures to our inventory to assist in lighting areas that may not have convenient access to an electrical outlet. 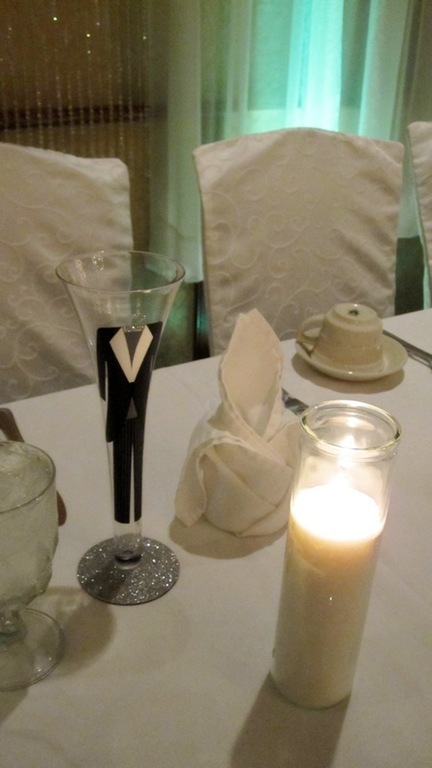 At Black Tie we believe that investment in innovation is an important part of providing Black Tie Service.